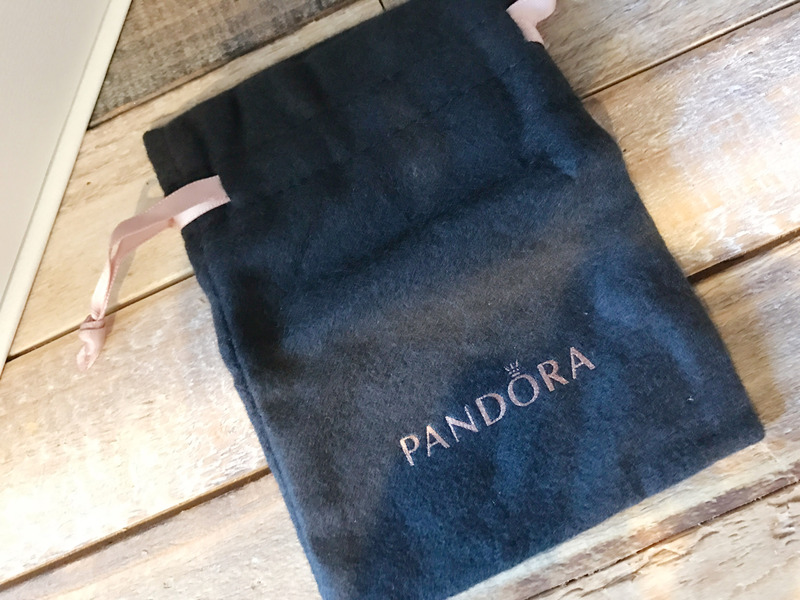 Exciting news for the Pandora lover! 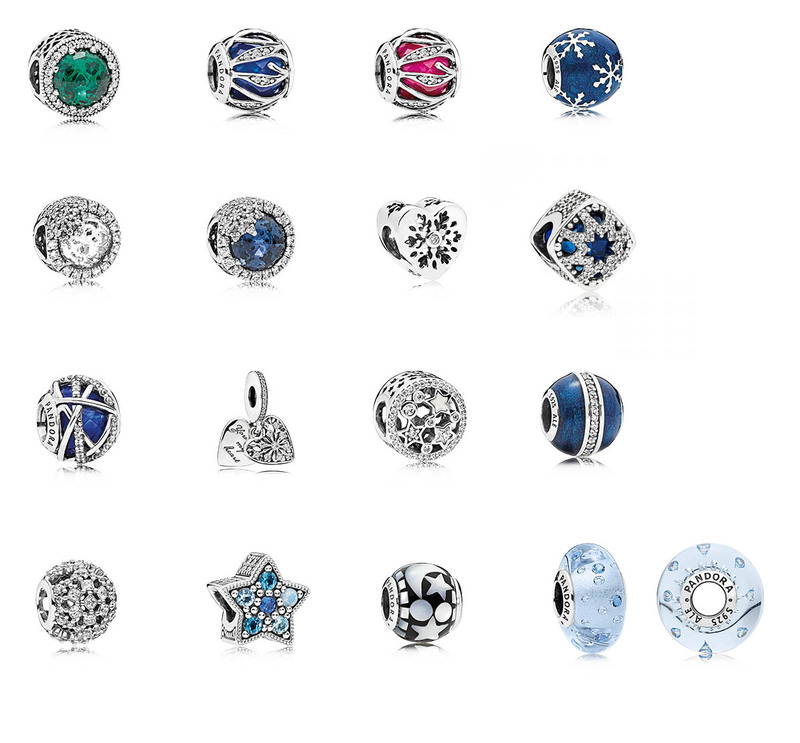 Pandora has just introduced a great new bracelet design for displaying your charms. 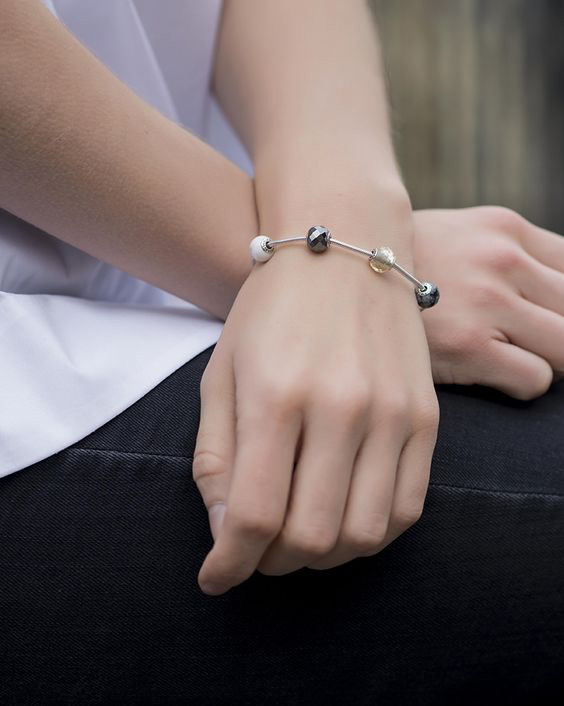 The open bangle is a cuff design that includes removable end pieces and movable silver stoppers. 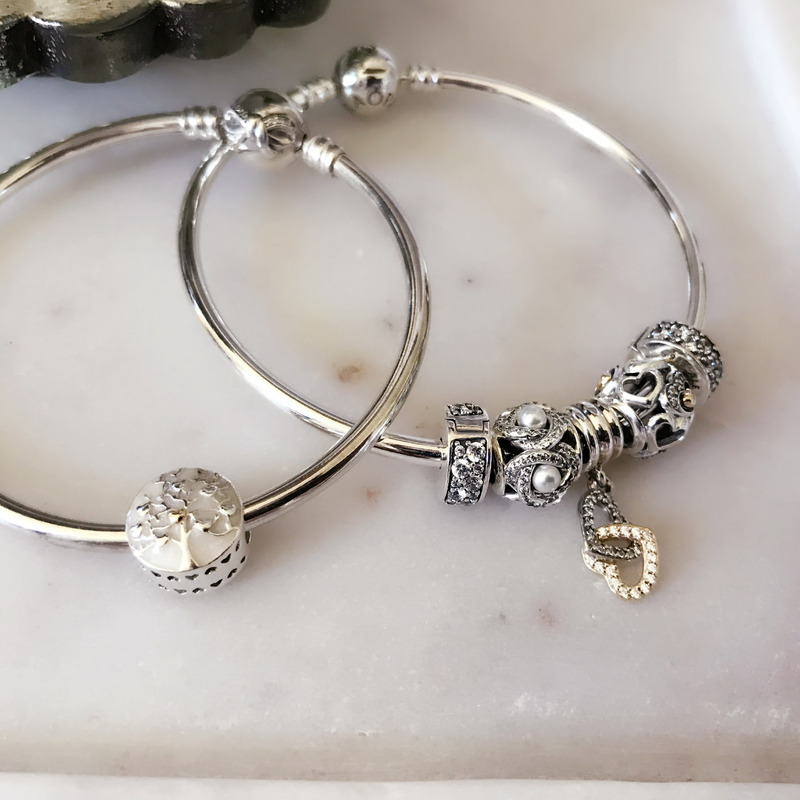 Showcase some of your favorite charms at the top of the bangle, or reverse it and wear it plain with the stylish end caps on top! 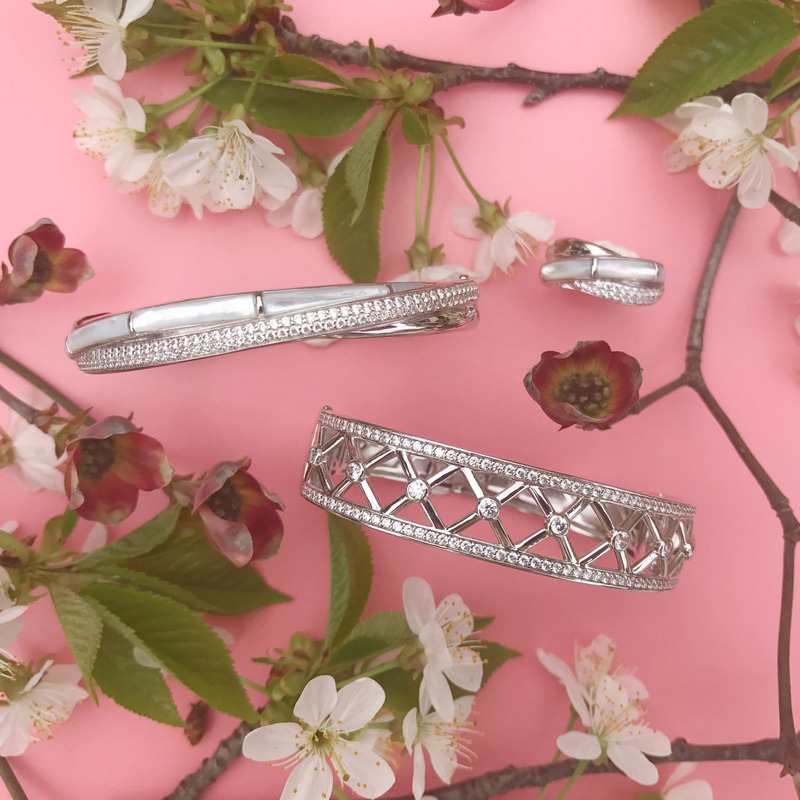 The open bangle is currently available in two designs. 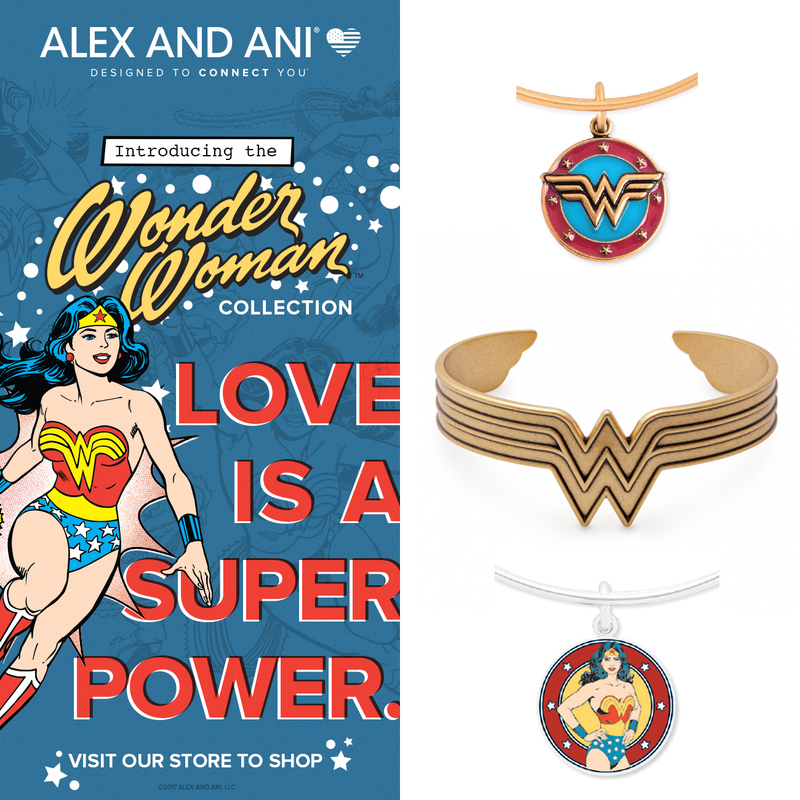 Both bangles are made from solid sterling silver. 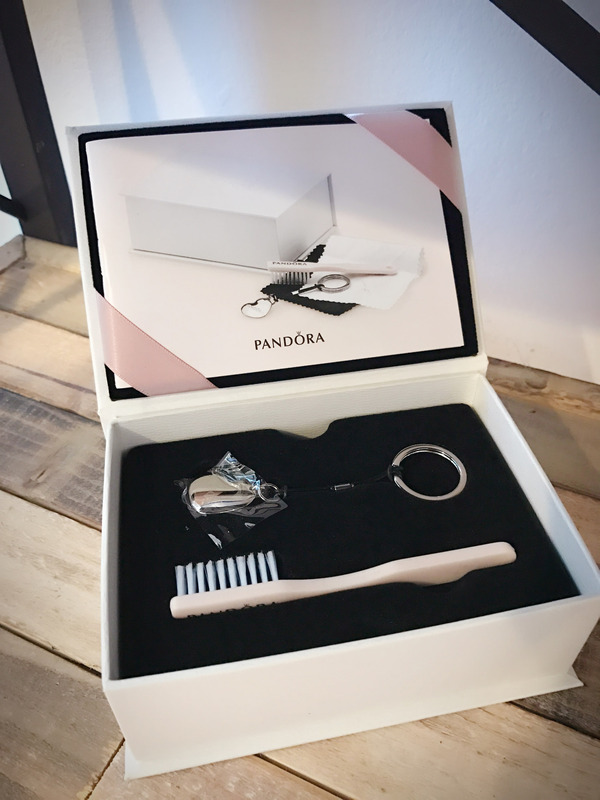 The first design has solid silver end caps with Pandora engraved on each side. 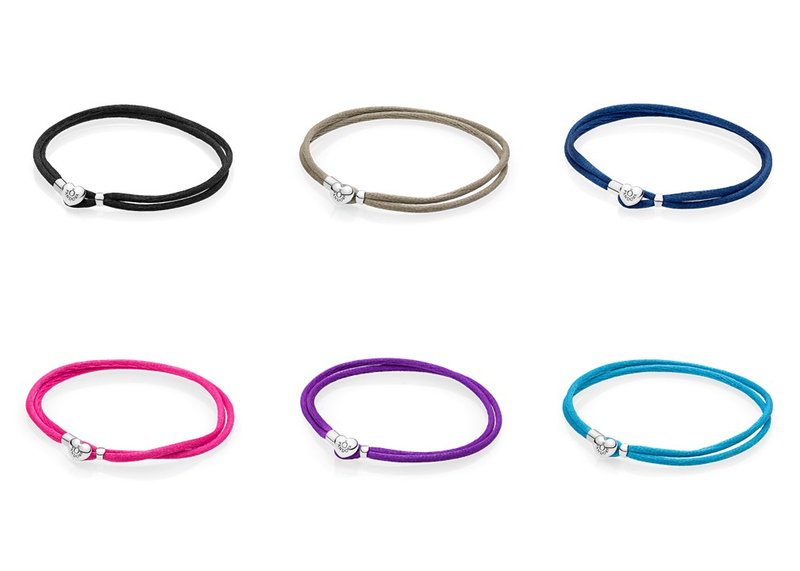 The second open bangle design includes gorgeous pavé end caps for a little added sparkle. 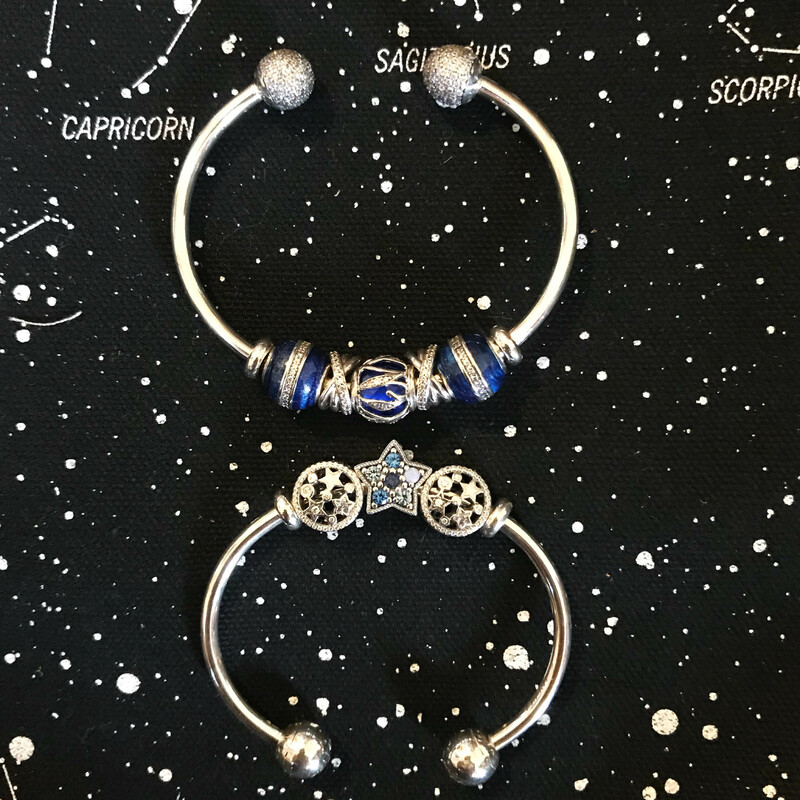 Each open bangle includes five pieces, the bracelet itself, two removable end caps, and two moveable (and removable) silver stoppers with silicon inserts. 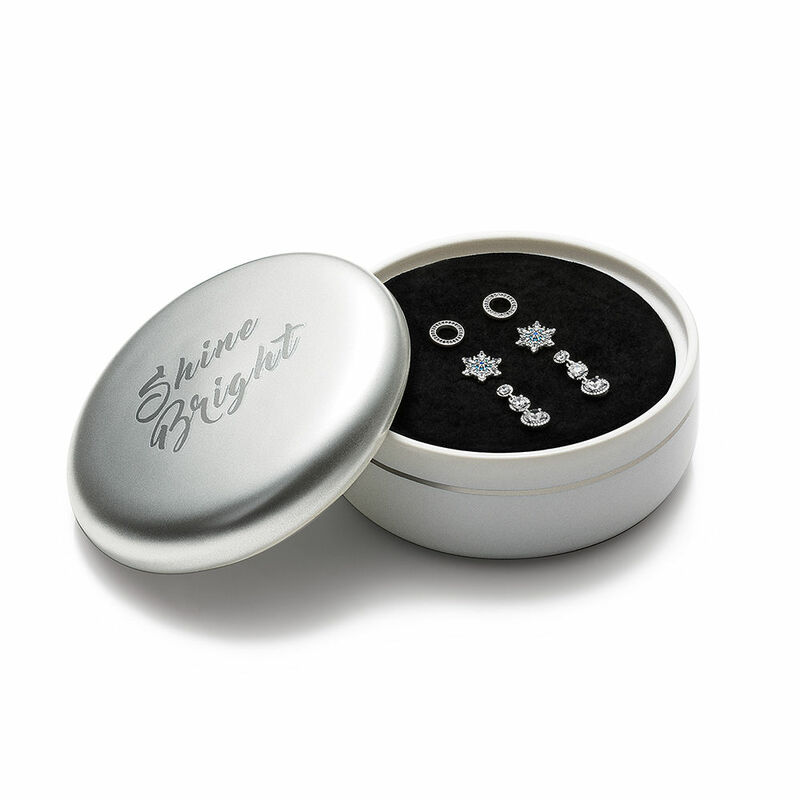 The silicon on the interior of the stoppers allows them to stay in position where you place them on the bracelet. 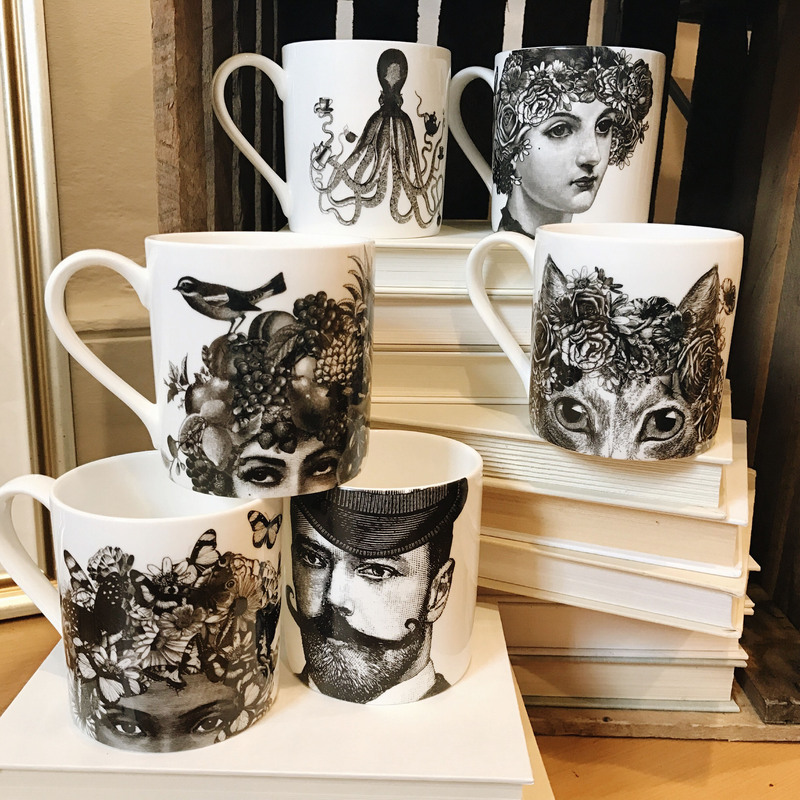 The new design is very easy to use. 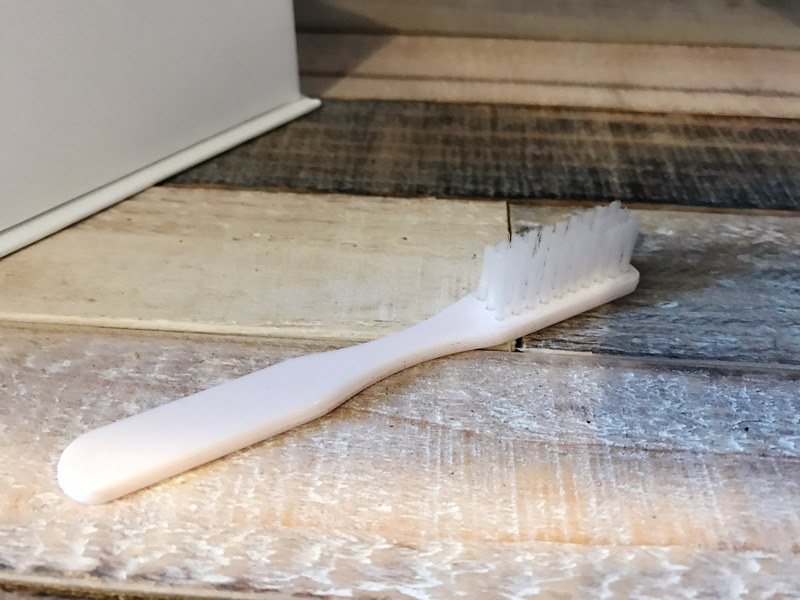 Simply push the end cap in and twist to remove! 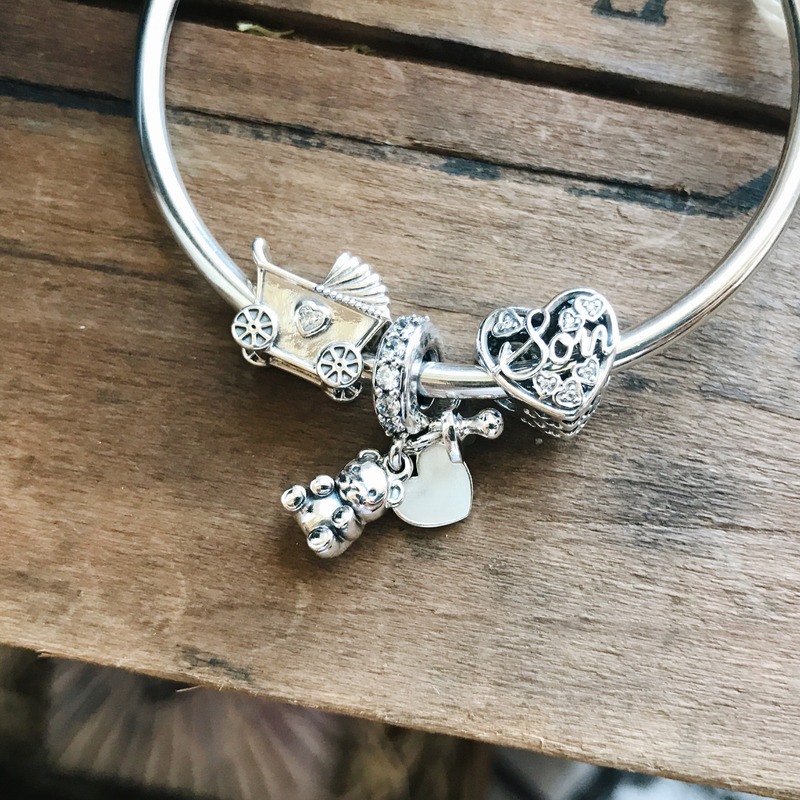 We love using this new bangle to feature some of our favorite charms to match our outfit of the day. 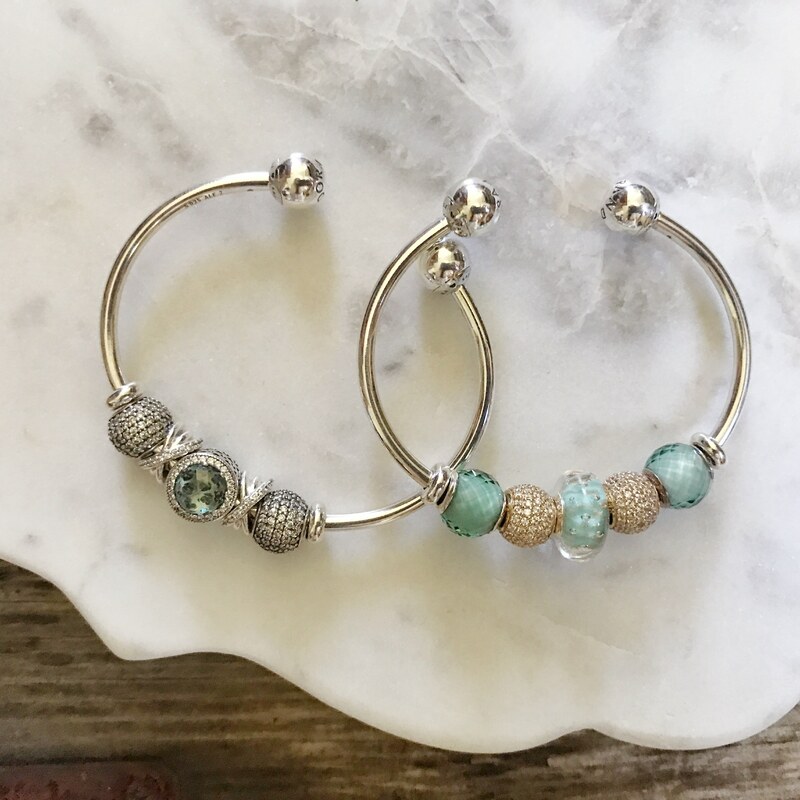 Unlike many of the other bracelets, the open bangle has no clasp to open and is ideal for those who have a hard time opening the traditional closure. 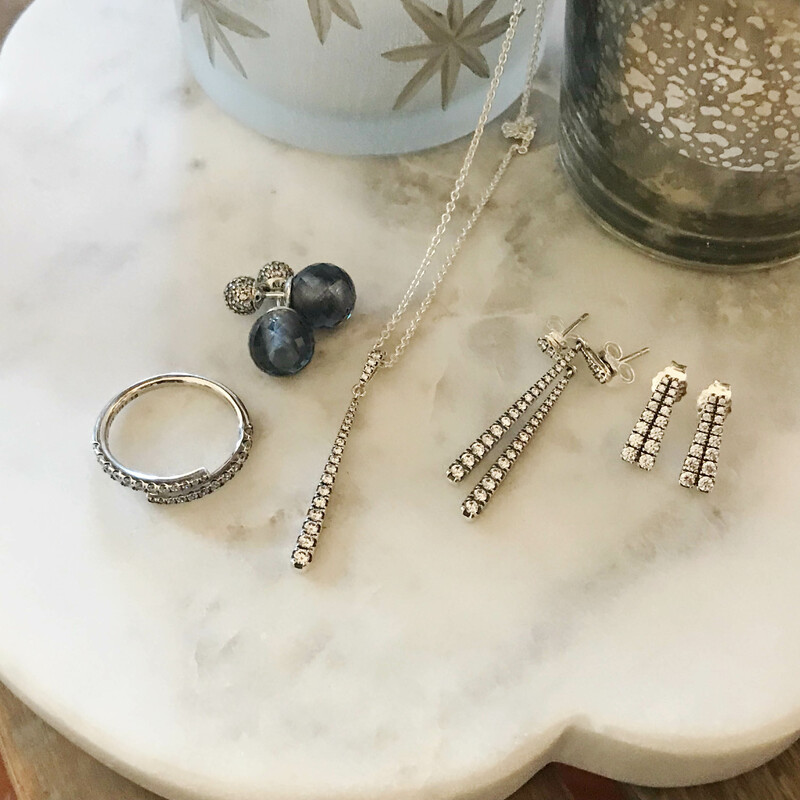 With its flexible design, it is easy to pop on before you head of the door and just as easy to take off for the night, making sure that your jewelry stays in its best (and most sparkly!) condition. 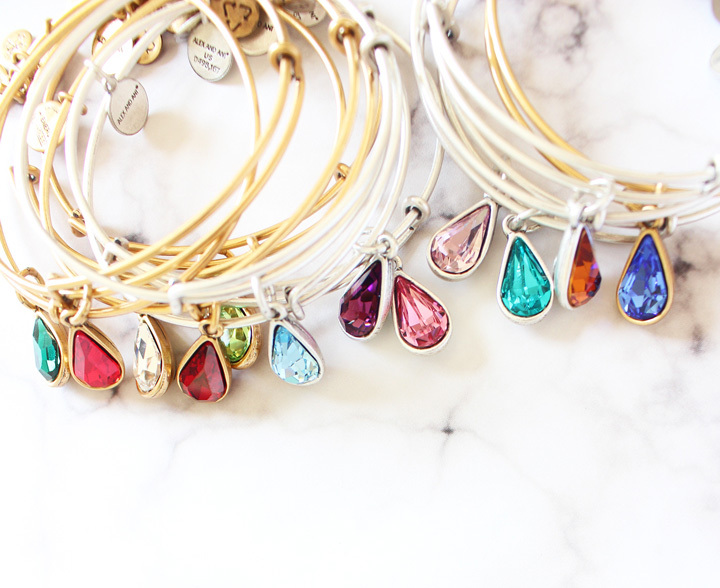 We also love that you can style the new open bangle in different ways. 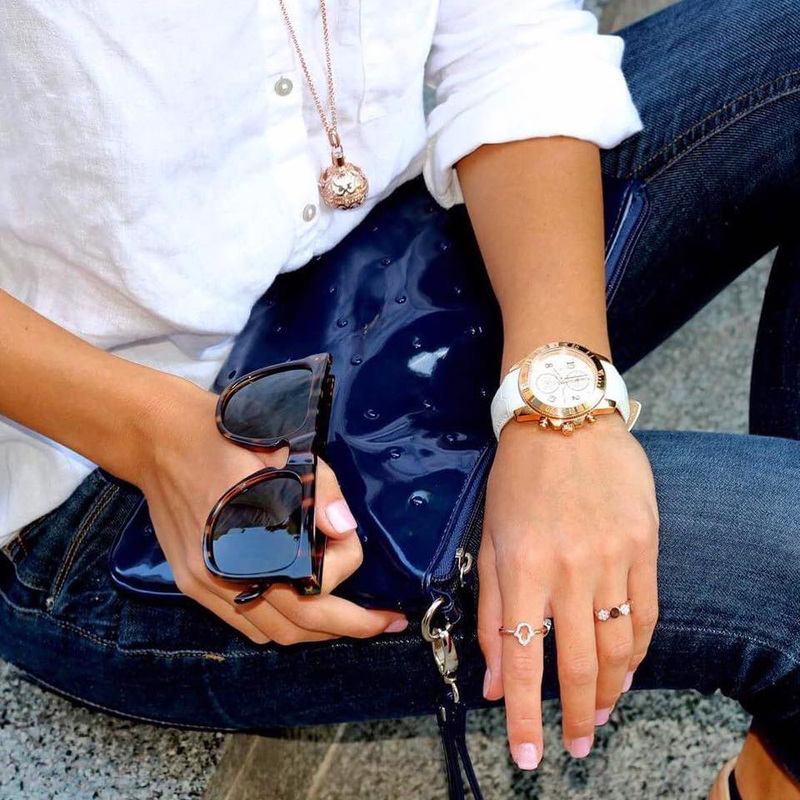 Add charms to the center of the bangle and wear them on the top of your wrist. Or, add a charm near each of the end caps and keep in place by sliding the silver stopper to the end after the cap has been replaced. 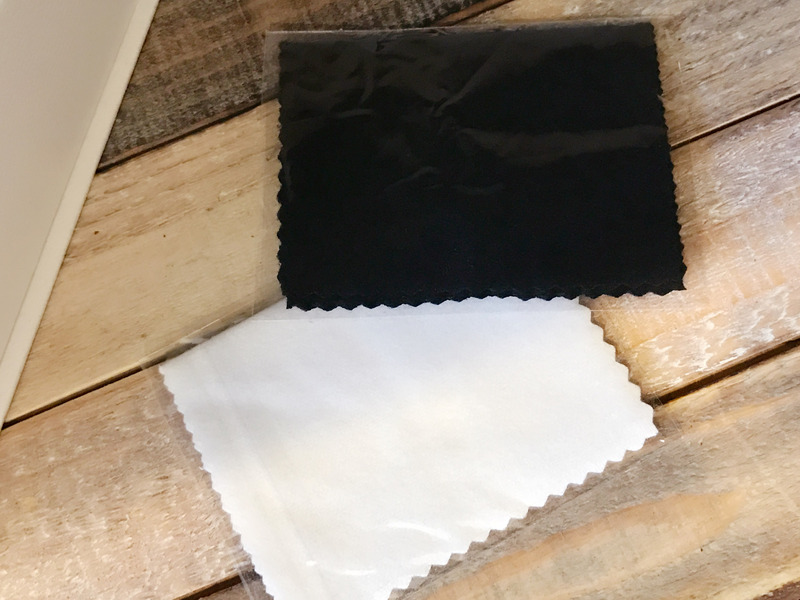 Want a minimal statement today? 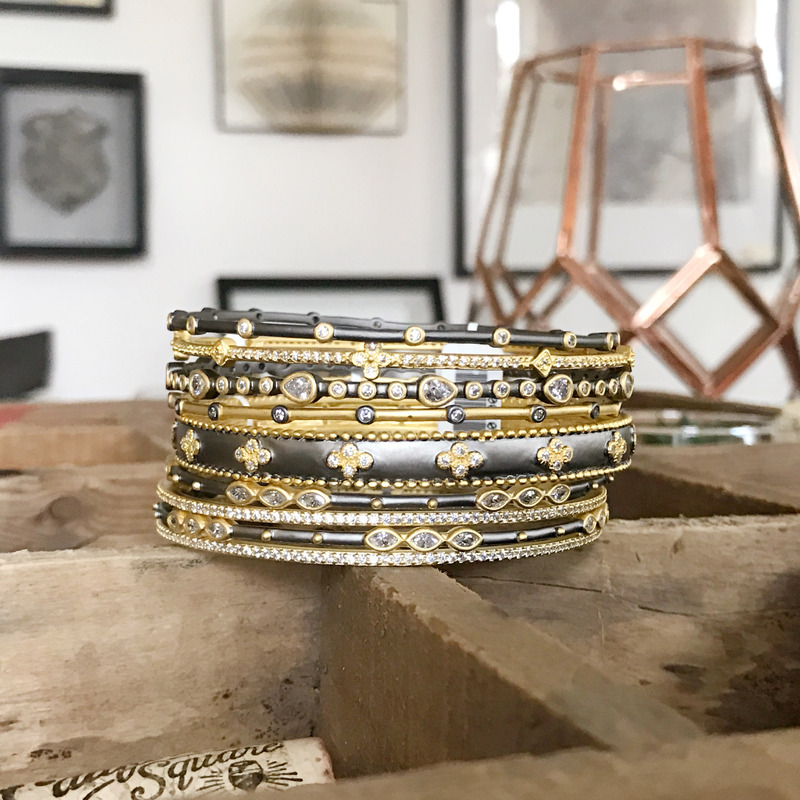 This beautiful bangle makes a simple statement when worn by itself. Pull the stoppers all the way to the end caps to give it a “finished” look! 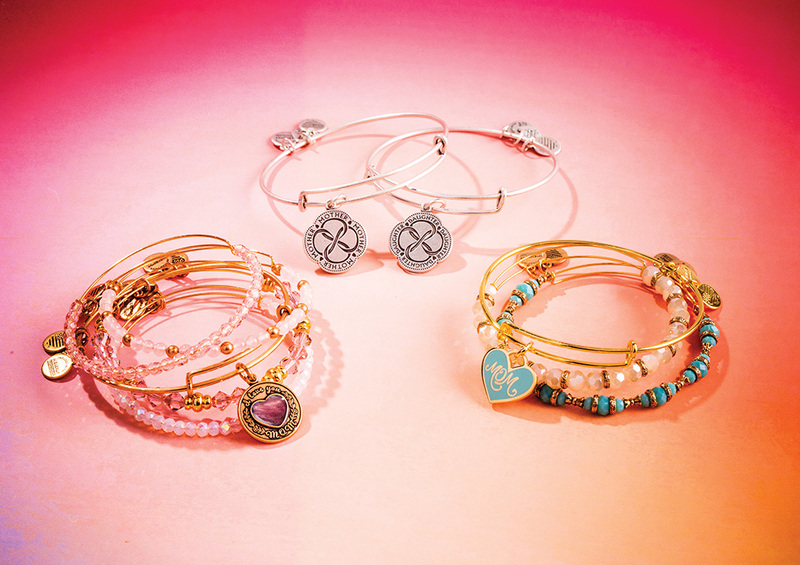 We Love Mixing the Bright Silver Bangle with a Touch of Pandora Rose! 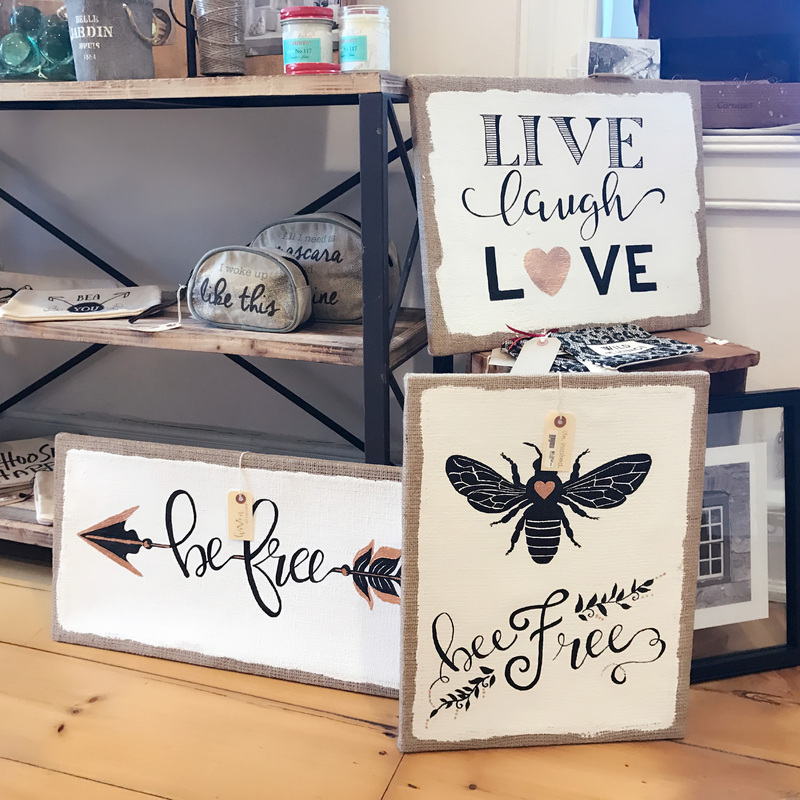 Get your summer vibes ready! 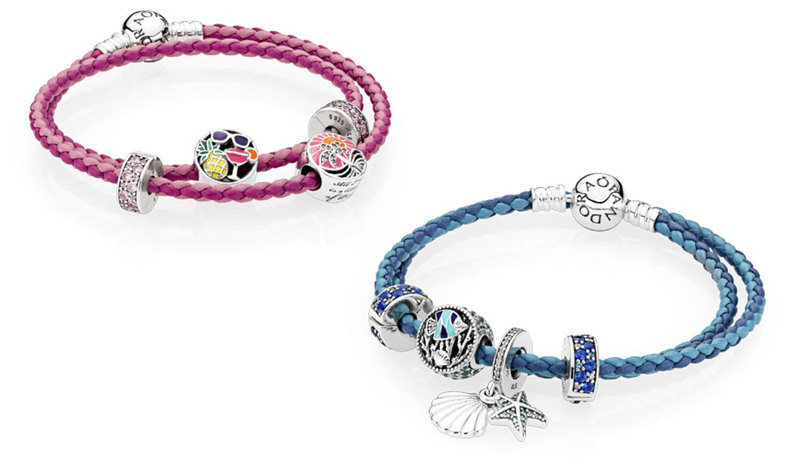 The Pandora Summer collection arrives at Versant on June 1st, and it is full of tropical fun. 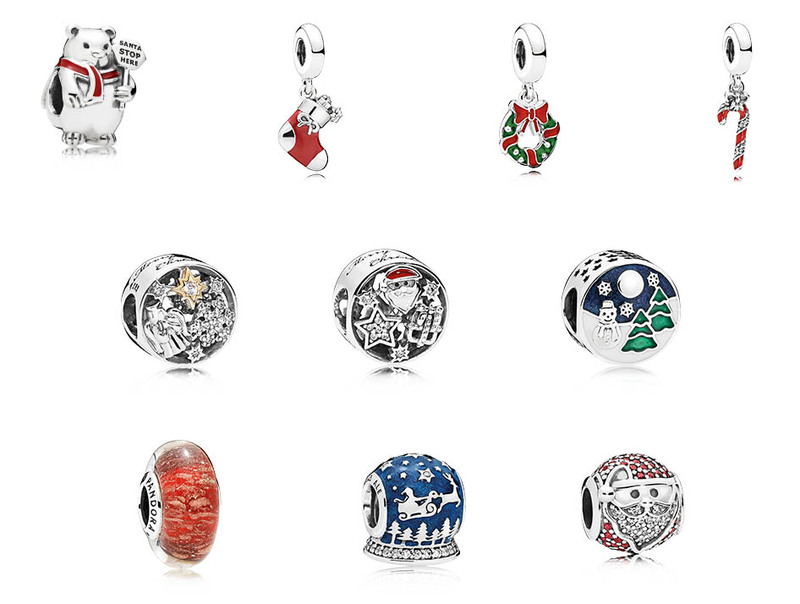 As compared to past years, these new charms are more colorful and whimsical. 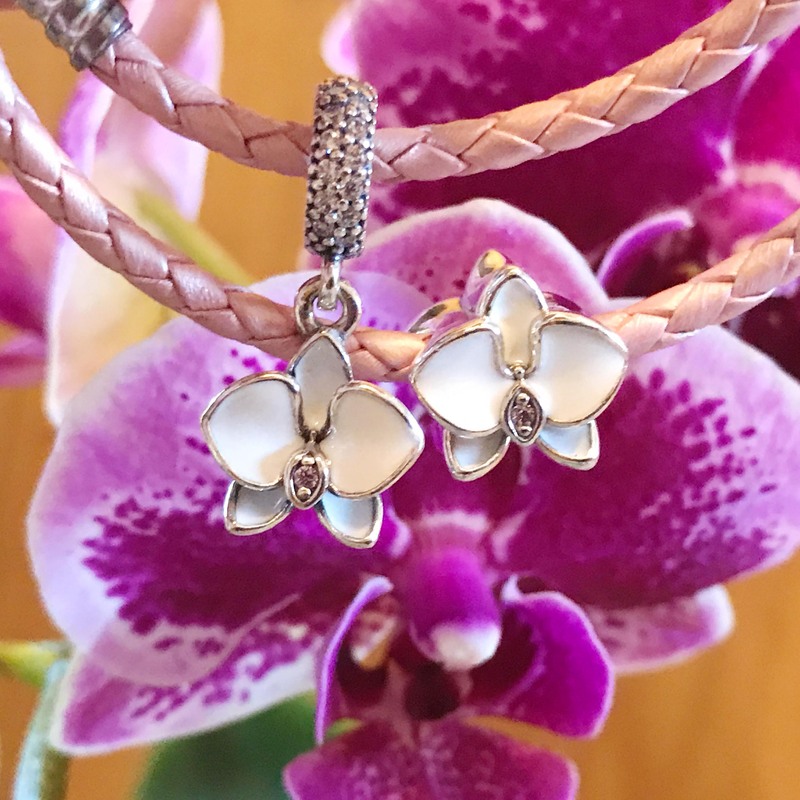 A fan-favorite, the orchid, has received an update with new styles and colors. 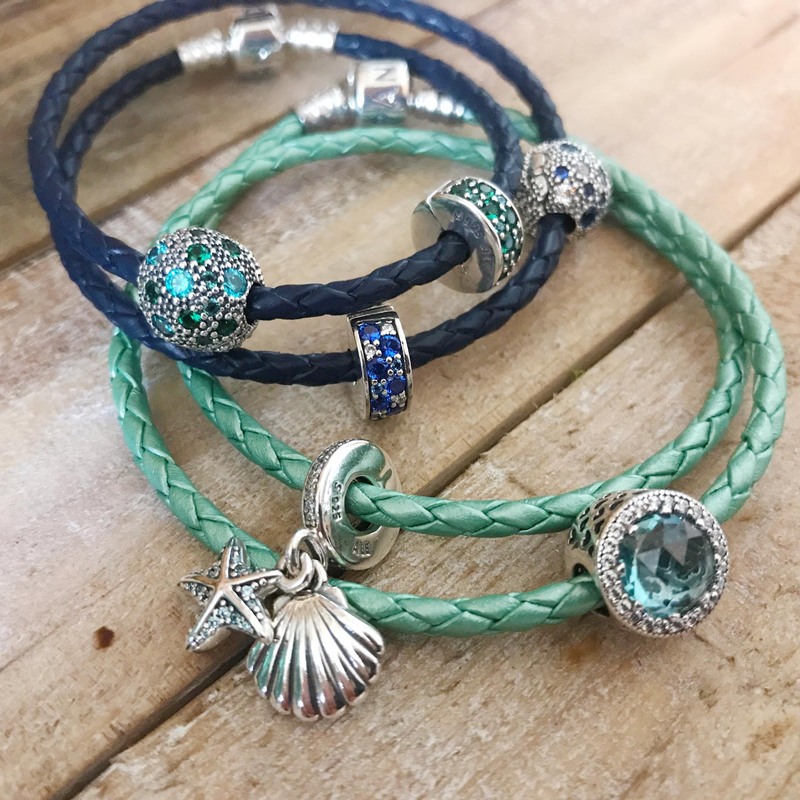 There are also some beautiful water-inspired blues and greens that will make the perfect addition to an existing summer bracelet. 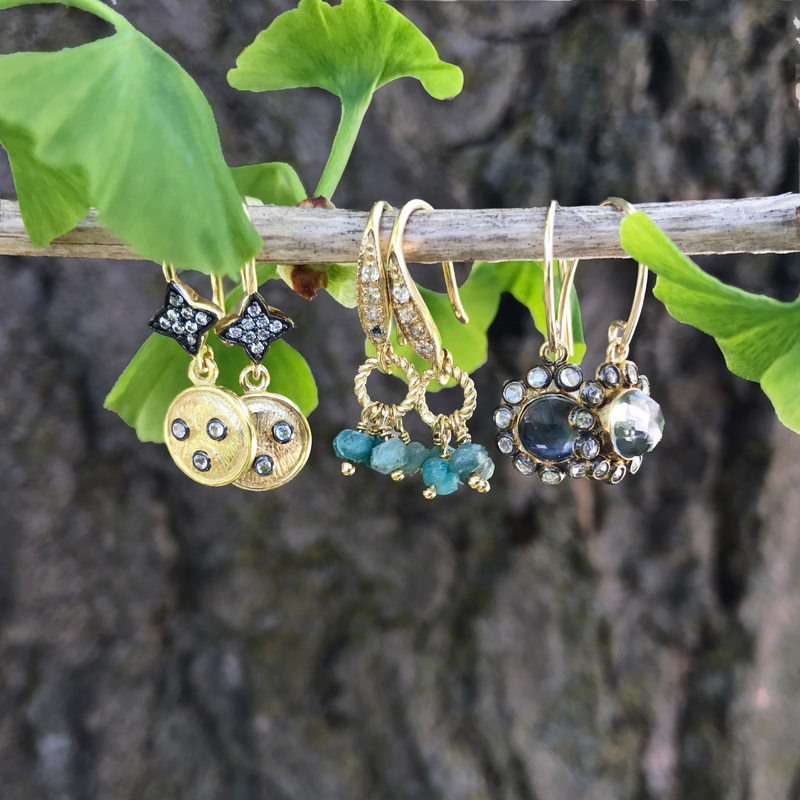 See our full review of the new charms and jewelry of this mini collection below! 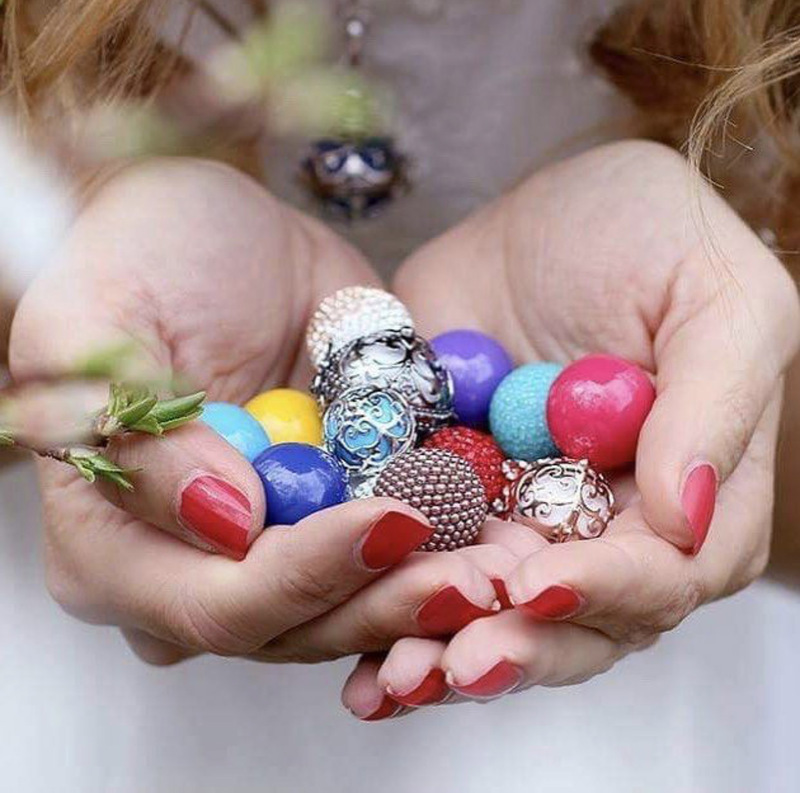 The bright enamel that we fell in love with in the spring collection is back on a series of button-style charms that celebrate our favorite things about summer. 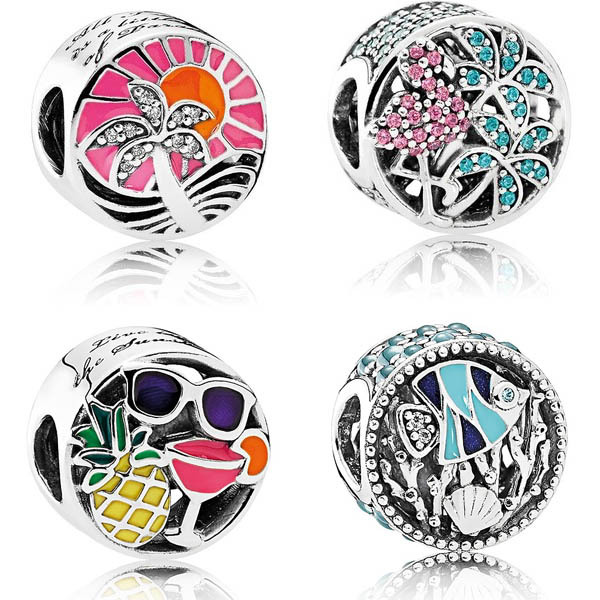 These new charms honor our favorite parts of summer- fun in the sun, beach vacations, and a summer cocktail! 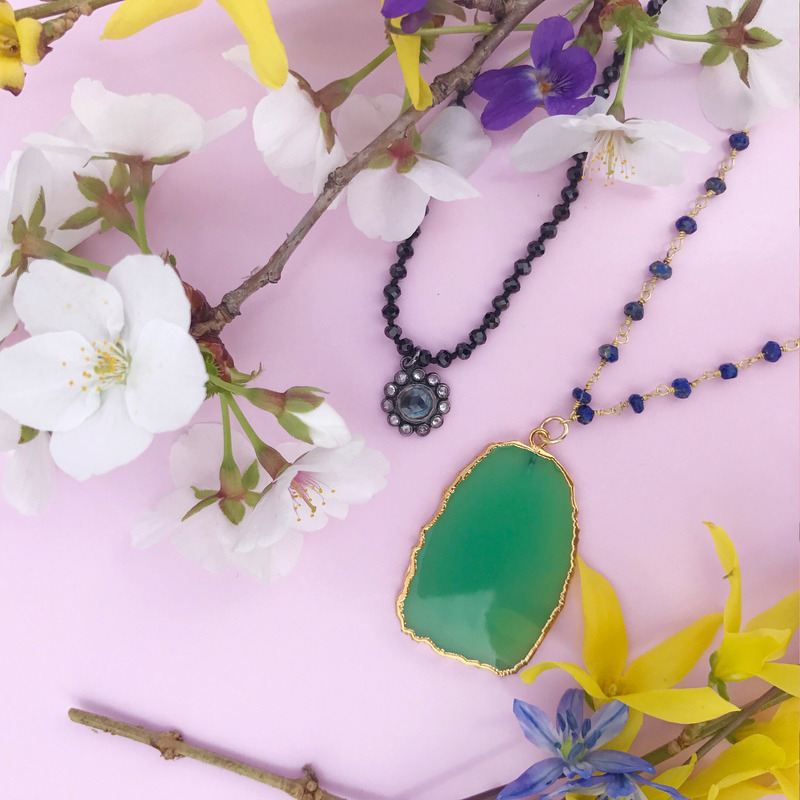 The celebration of summer fun is reflected in the bright colors and touches of sparkle. 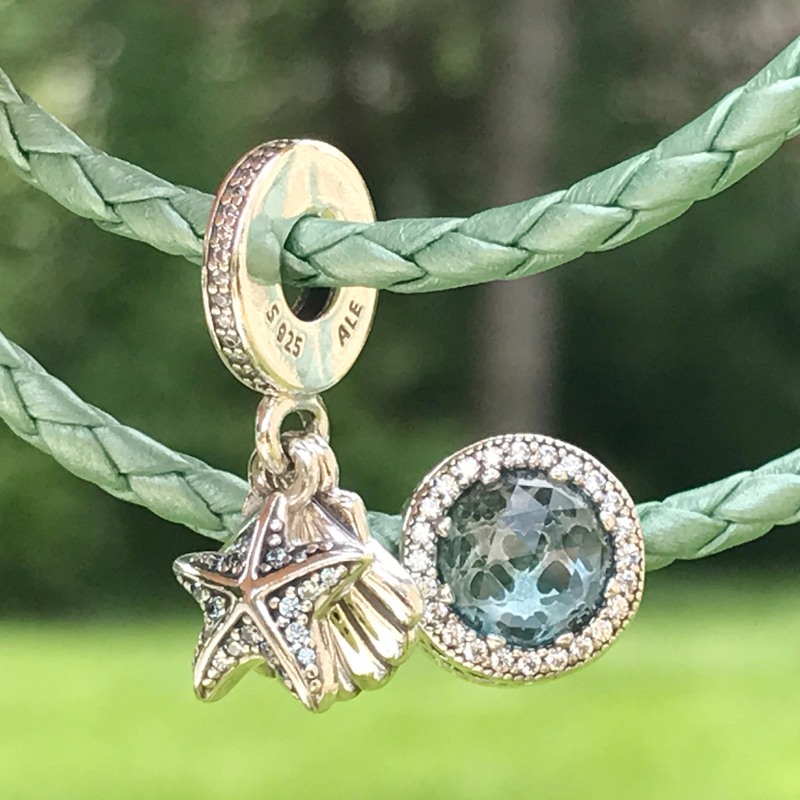 The Summer Fun and Tropical Sunset charms add an extra layer of whimsy with the cute phrases engraved on the side of the charm. 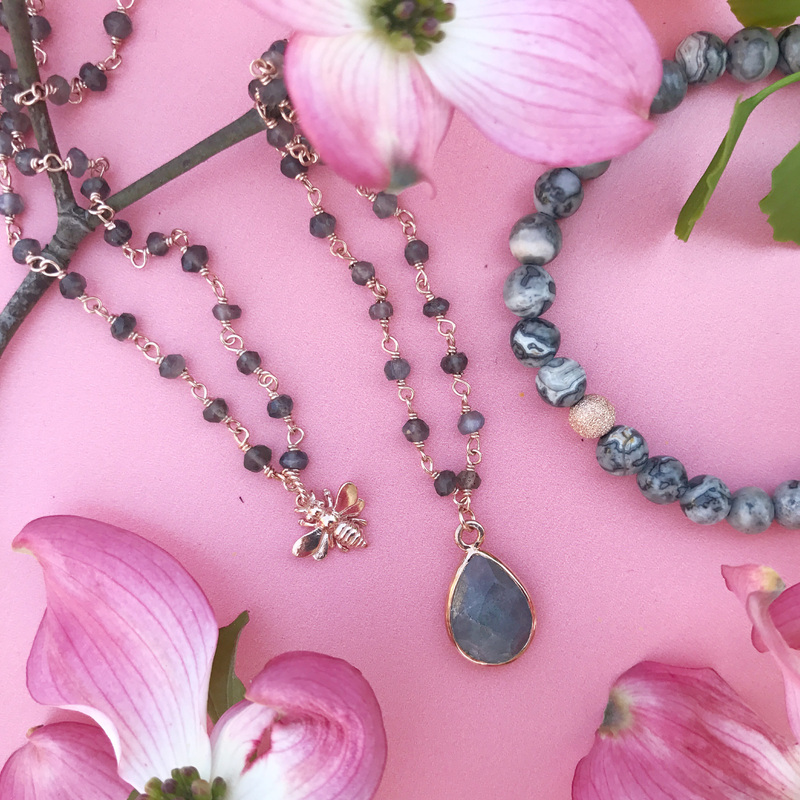 Taking off of the colors of a tropical sunset, the summer collection includes beautiful corals, bright fuchsias, and soft pinks. 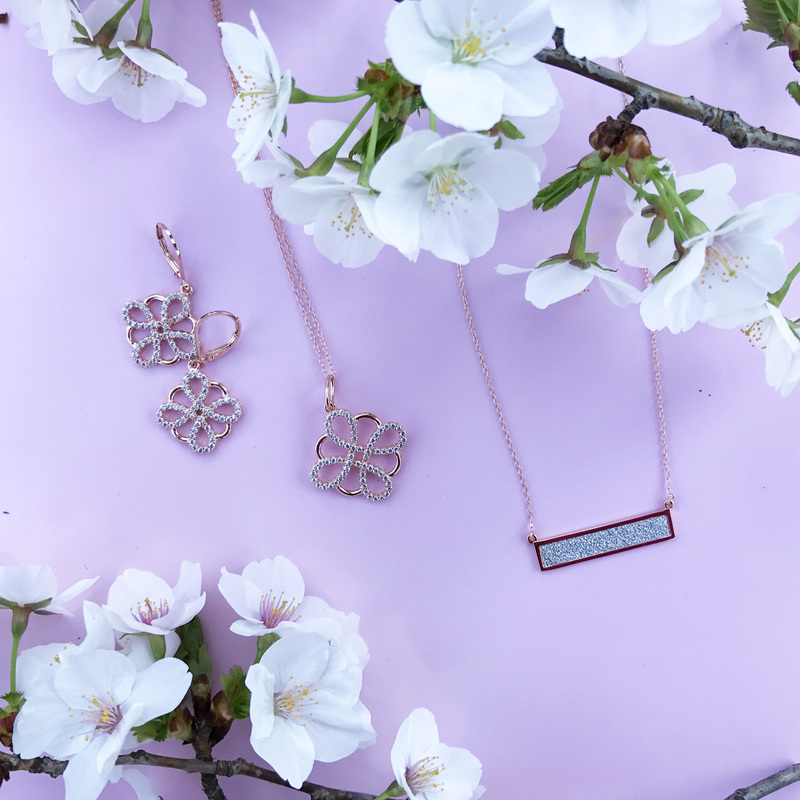 Some of our favorite additions are the new orchid designs in both white enamel with light pink stones and radiant orchid enamel. 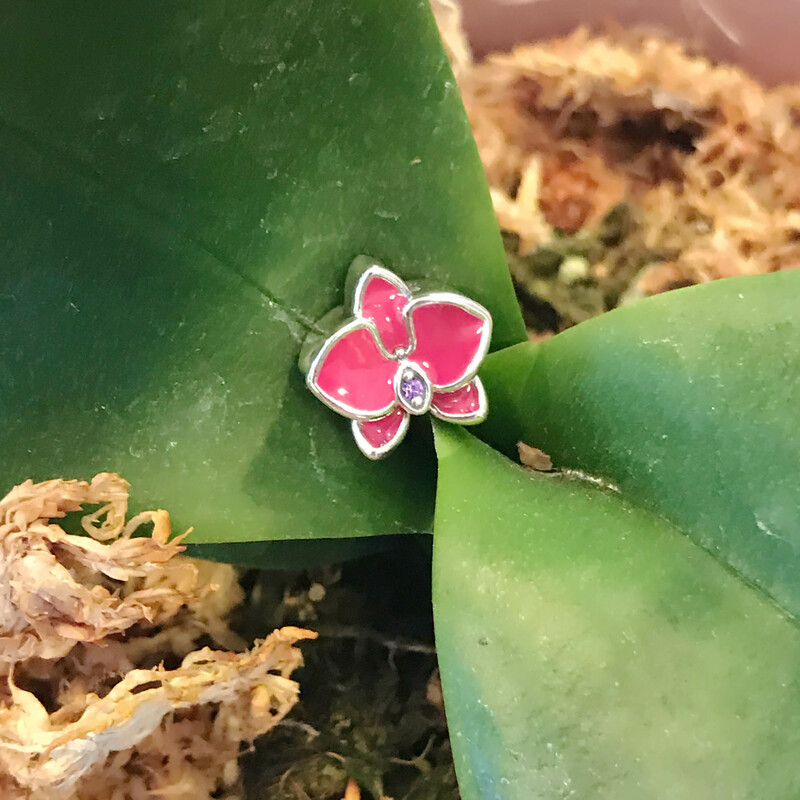 Not only does the orchid make an appearance as both a dangle and button-style charm, but they appear in a sweet pair of petite stud earrings as well! 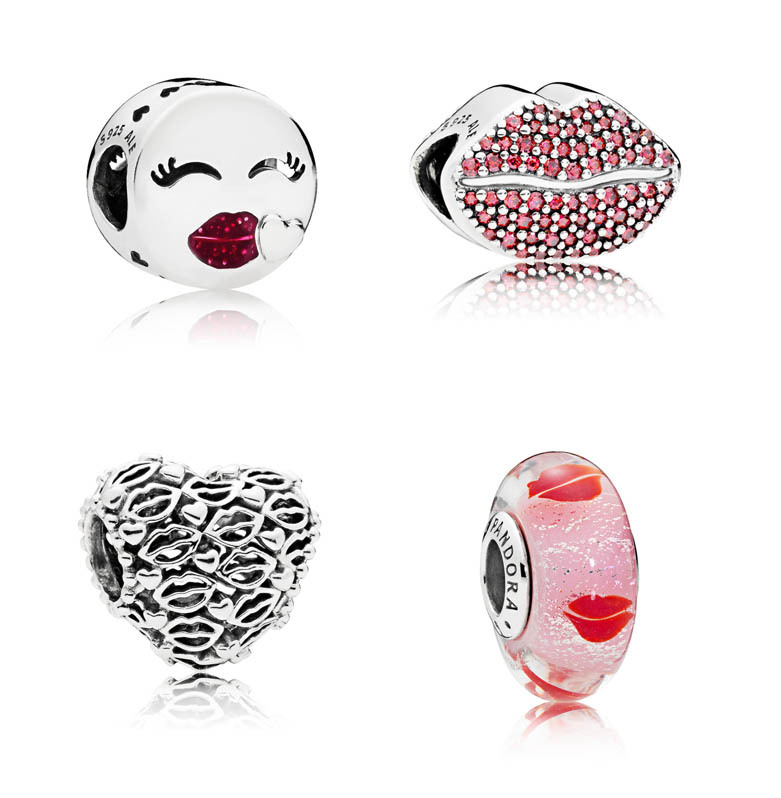 For the murano glass lover, three new charms have been added. 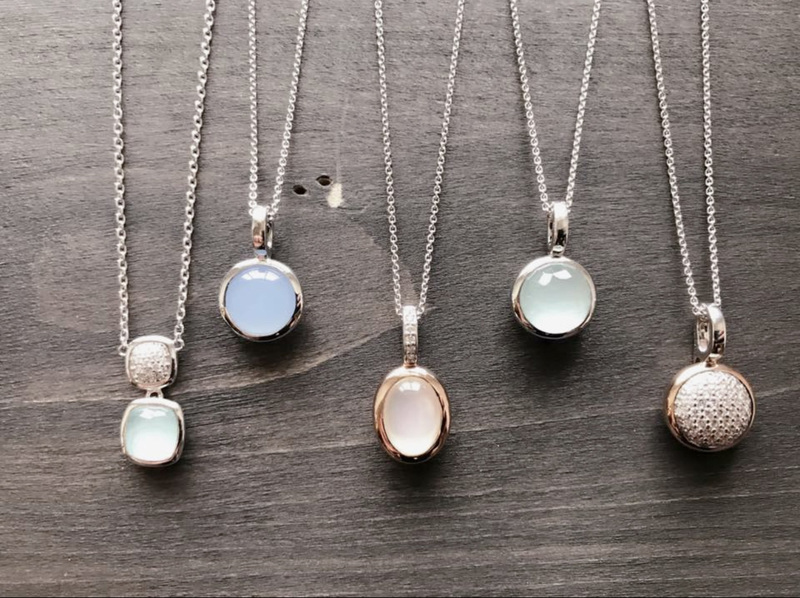 The mint and light pink glitter charms show off the softer side of summer with light colors interspersed with sandy threads of gold. 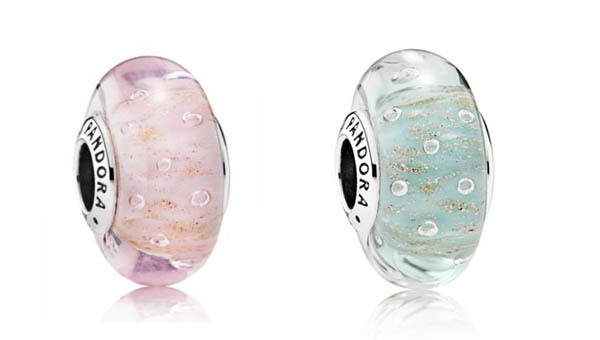 We are in love the new koinobori murano charm inspired by koi fish scales! 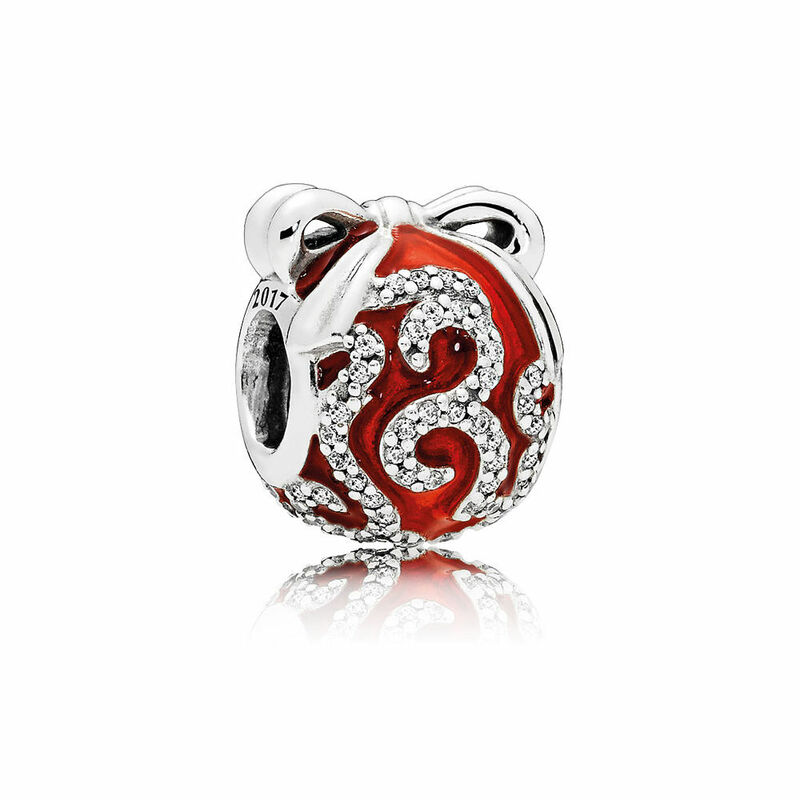 The gorgeous deep orange of this charm is a great complement to the bright pinks of the rest of the collection. Everyone loves the sight of the teal and blue tropical ocean waters. 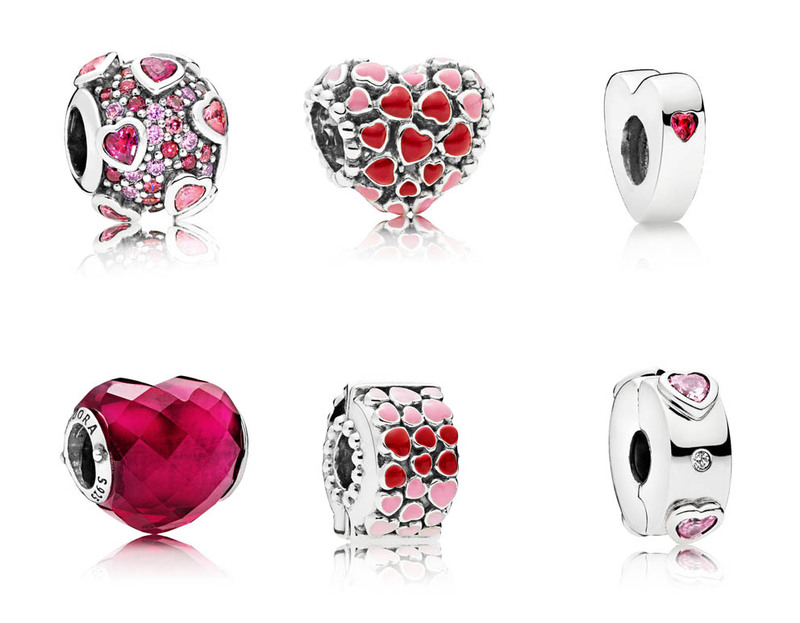 Pandora used these beautiful hues as another focus of their summer collection charms. 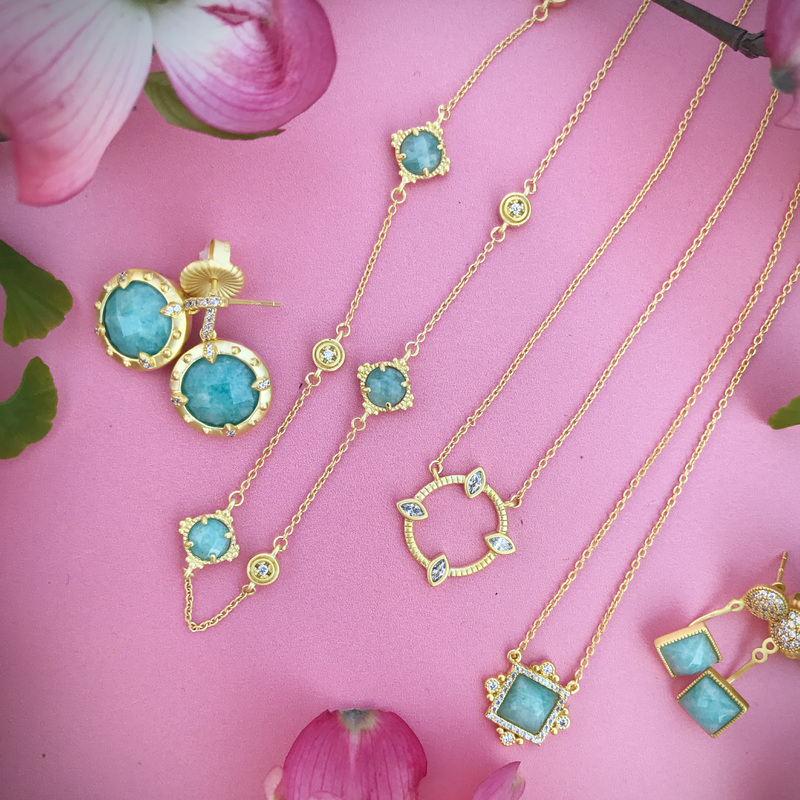 With frosty mint, teal green, and bright blues, these pops of color remind us of the summer seas. 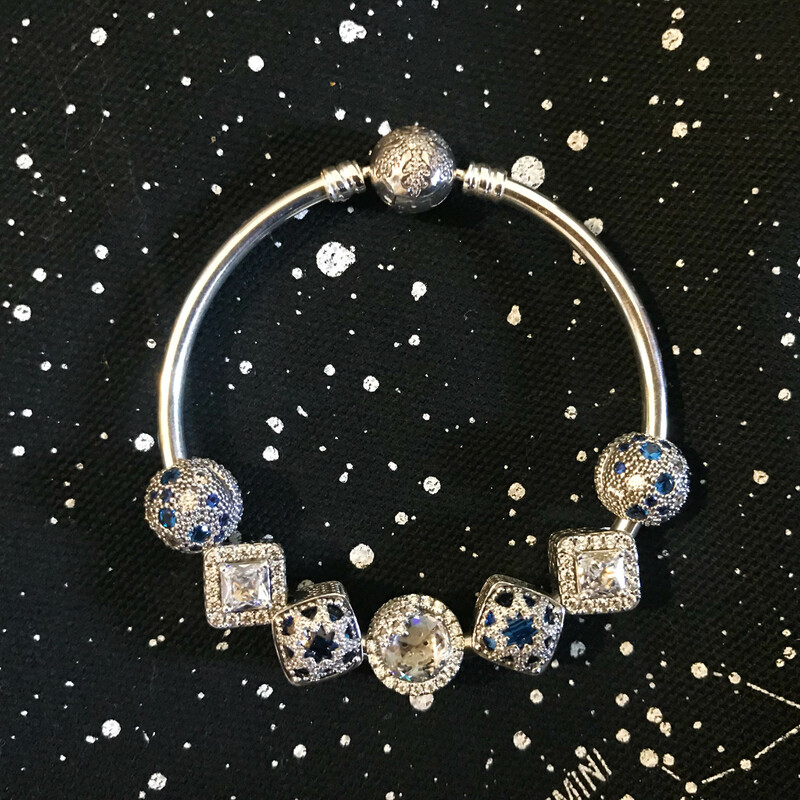 Five new clips were released as part of the summer collection- two new cosmic stars clips and three new shining elegance clips with silicone insert. 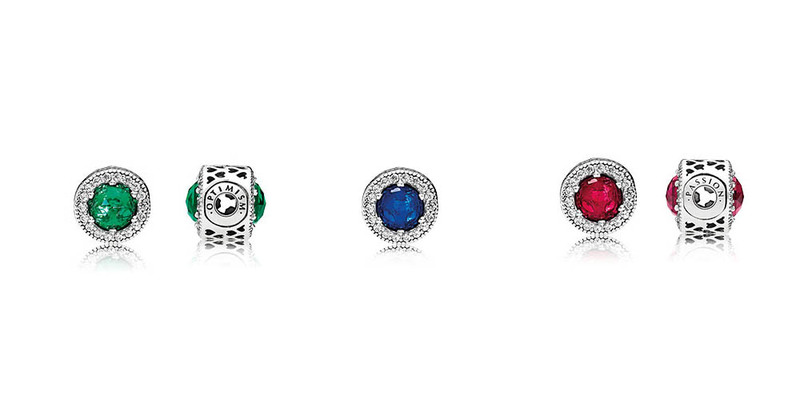 All of the new clips mix two colors in a mosaic effect to mimic the sparkling waters. 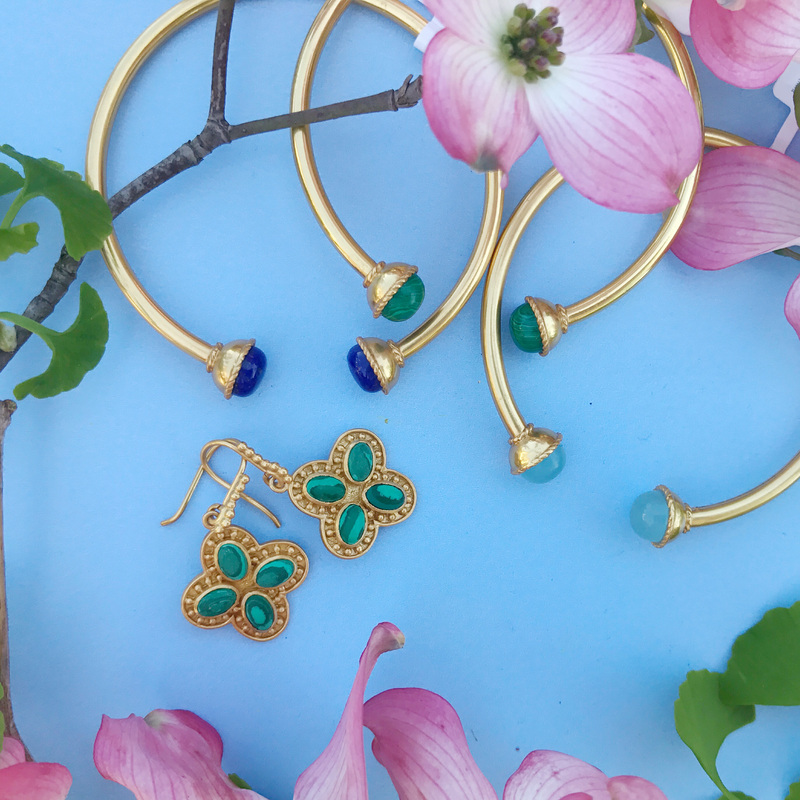 The greens and blues of the summer collection are a natural match to the beautiful enamel jewelry released during the spring. 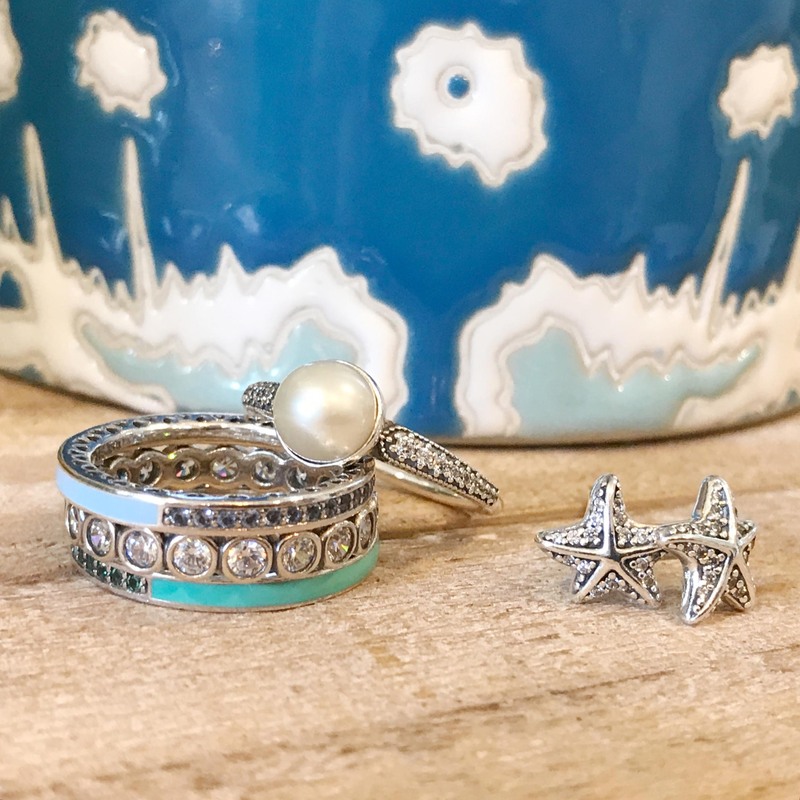 Accompanying these colorful charms is a newly redesigned starfish- available as a charm, pendant, and earrings! 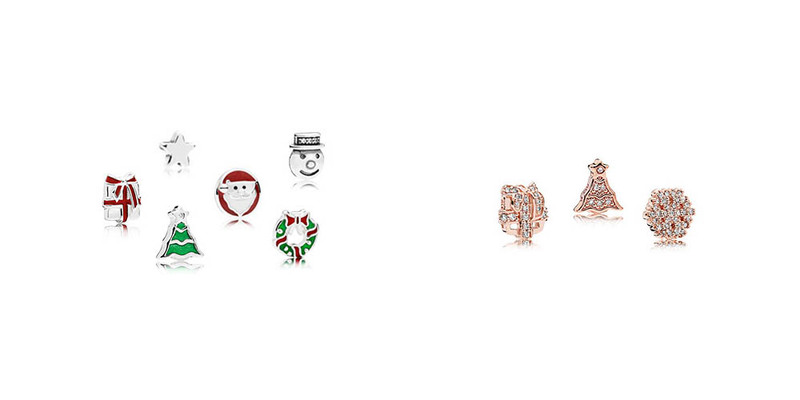 In addition to the starfish pendant, a new set of petite charms is available for the memory locket! 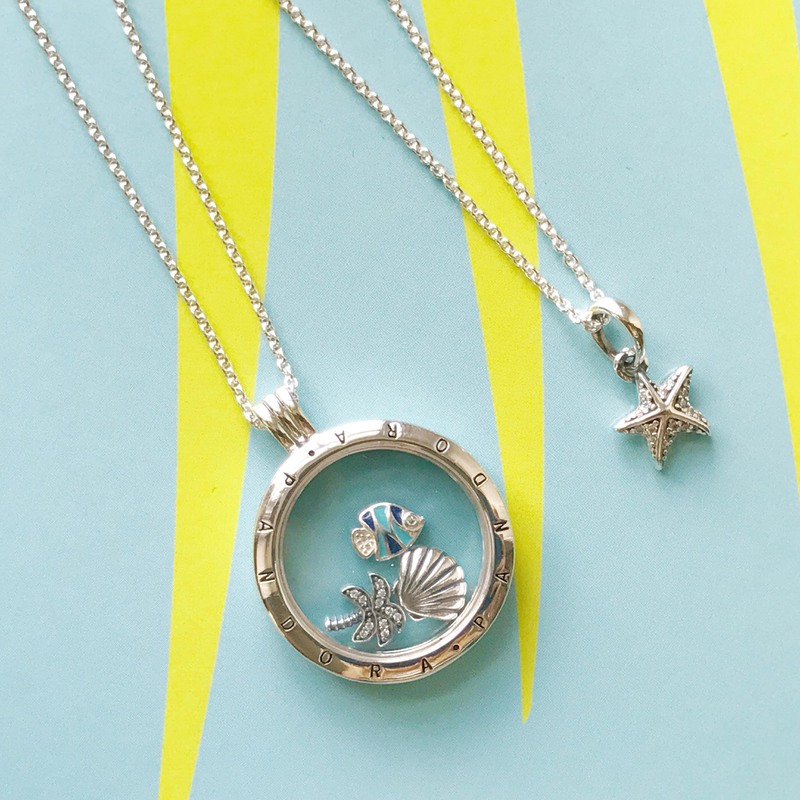 The new set includes an angelfish with bright enamel detailing, a sparkling palm tree, and bright silver seashell. 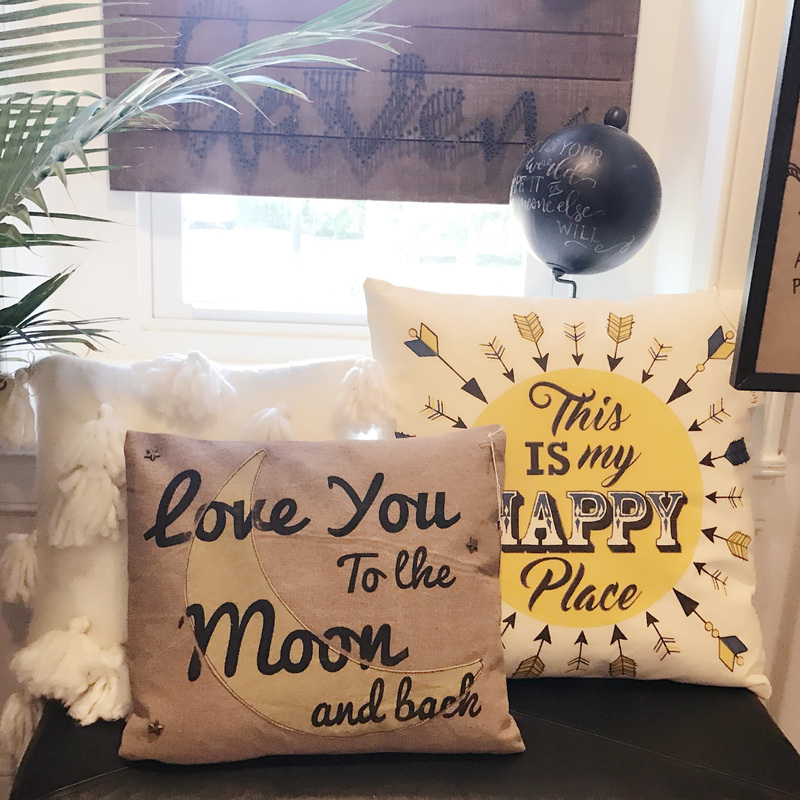 This set is a must have for the beach lover! 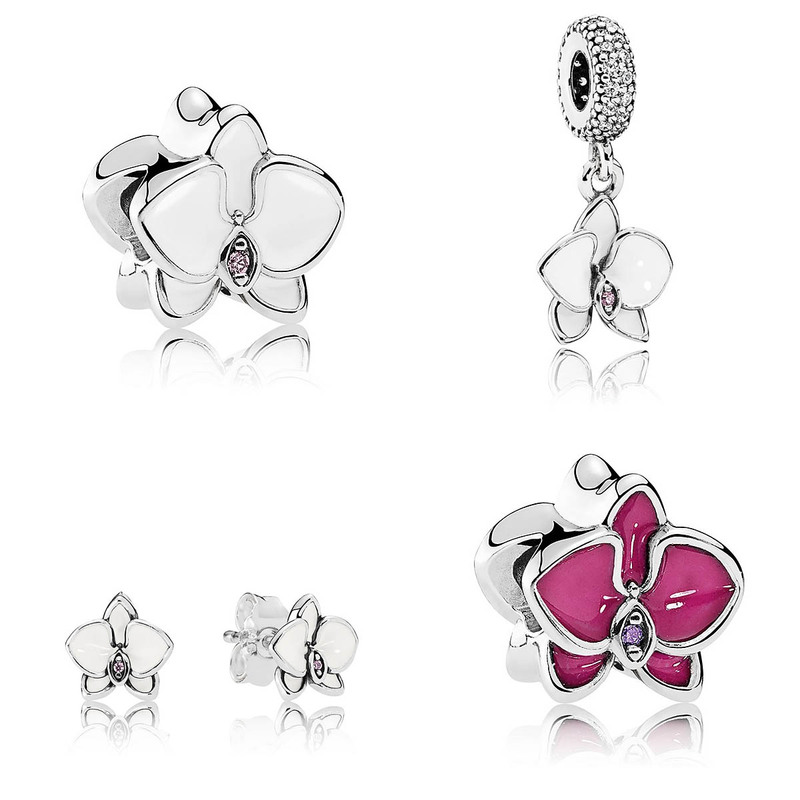 The Pandora Mother’s Day Collection Has Arrived! 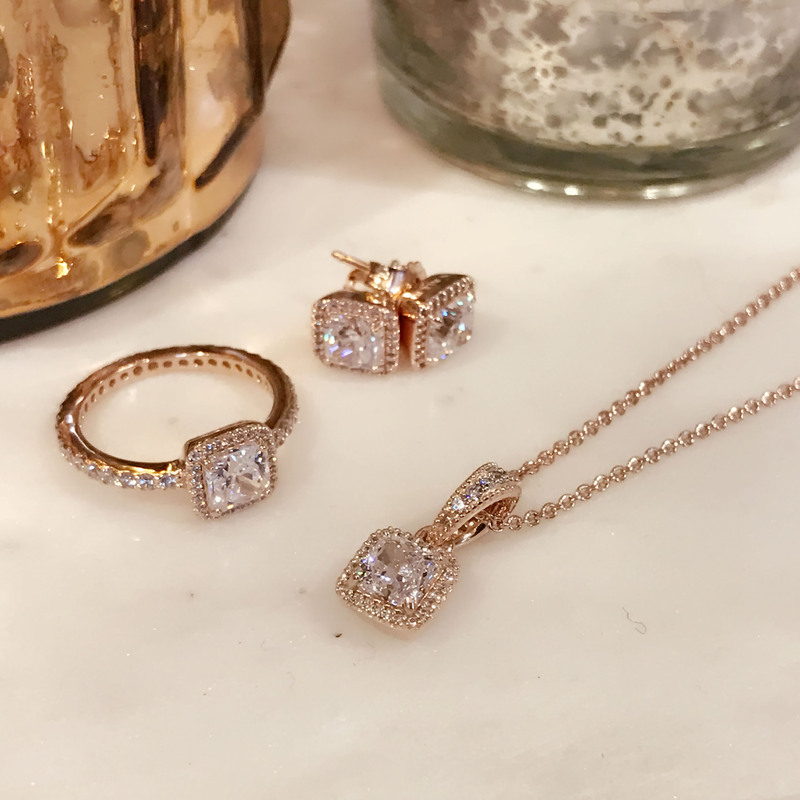 Are you ready to celebrate mom with some sparkle? 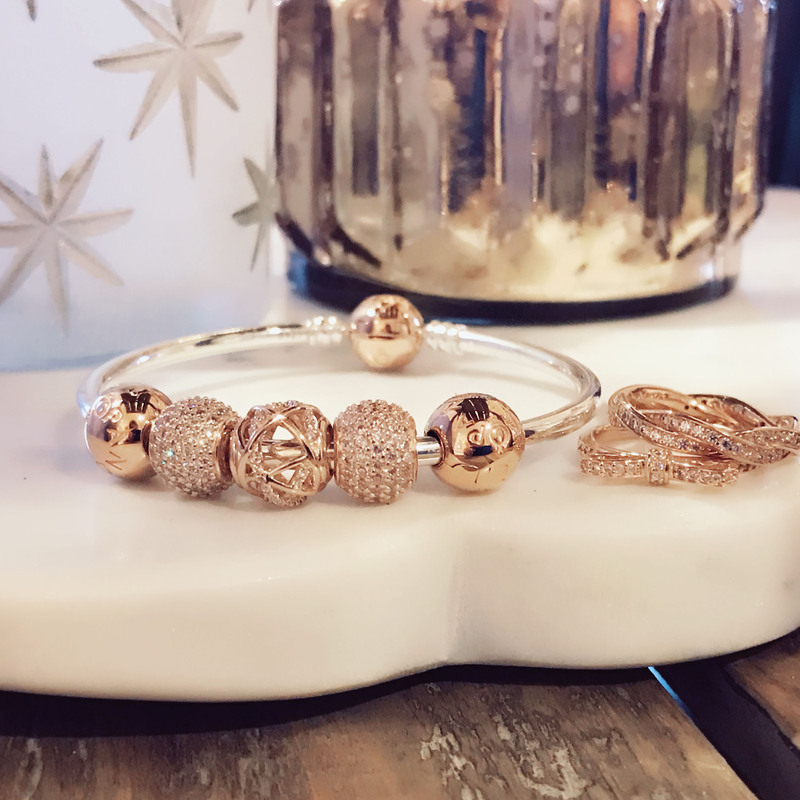 The Pandora Mother’s Day collection has arrived at Versant! 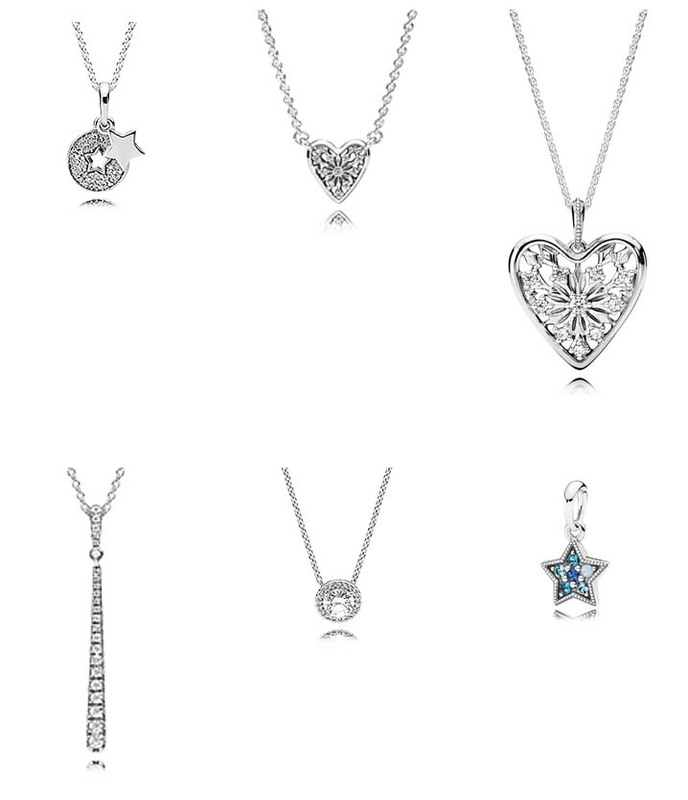 This collection adds some great new family charms and beautiful new jewelry options. 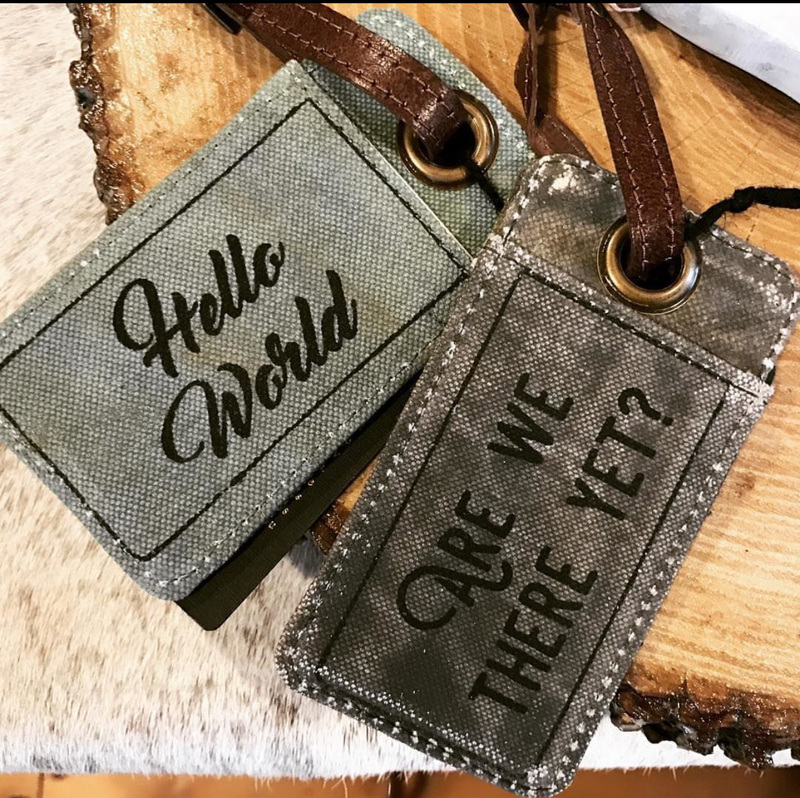 Check out our overview of the new pieces below! 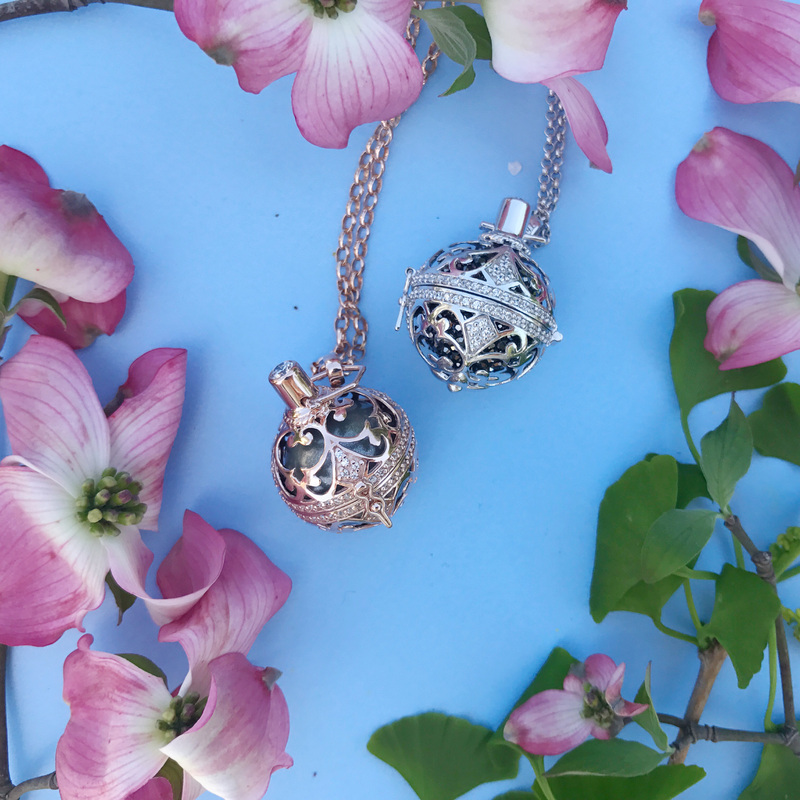 The Pandora Floating Locket and Petite Charms have been a very popular new addition. 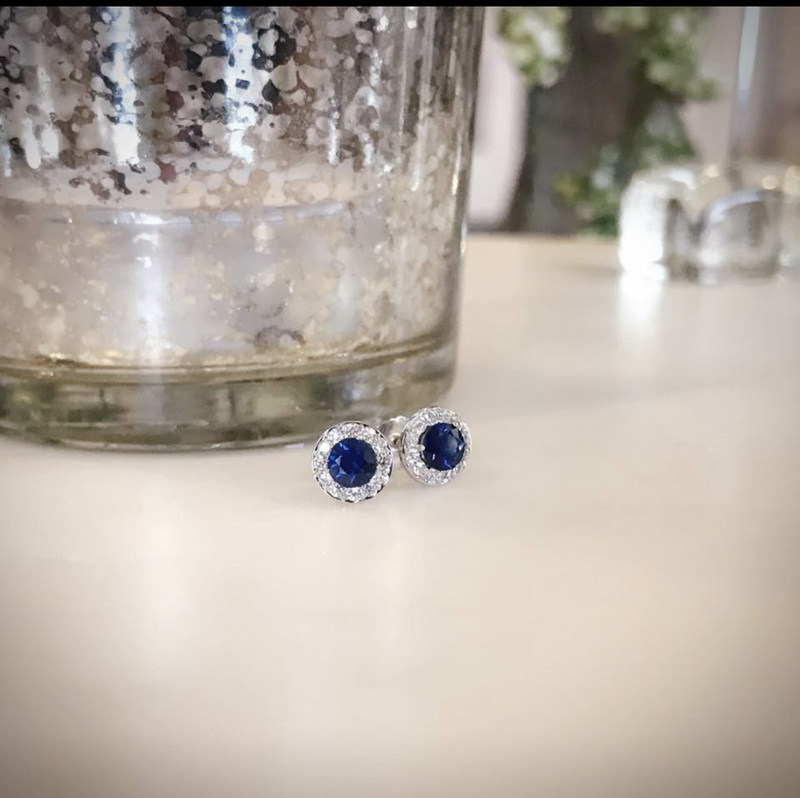 Made from sterling silver and sapphire crystal used in high-end watches, they are both high quality and high fashion. 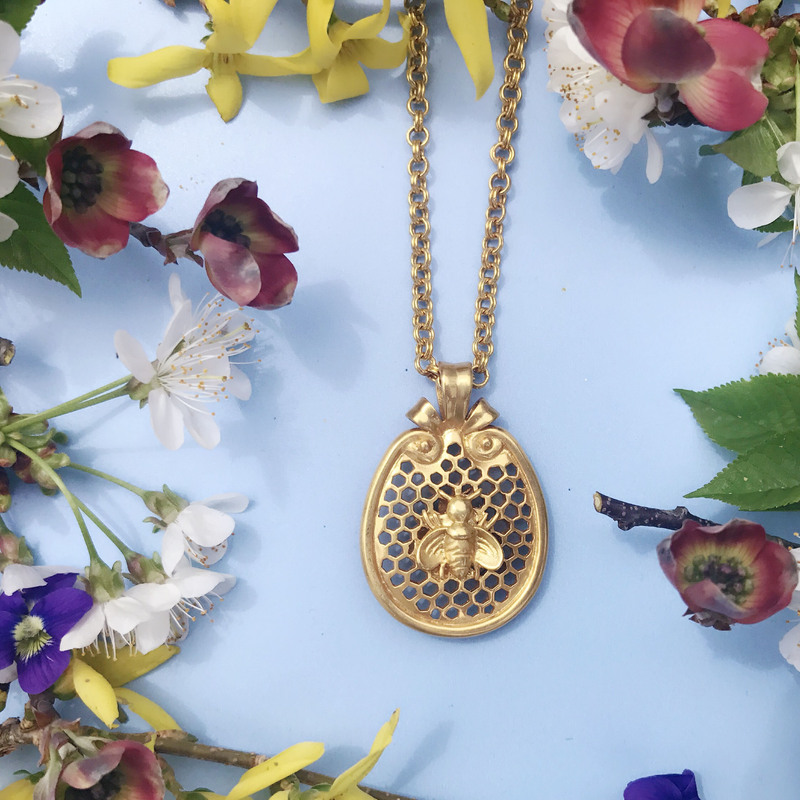 We are excited that they have expanded their locket offerings with the Mother’s Day collection! 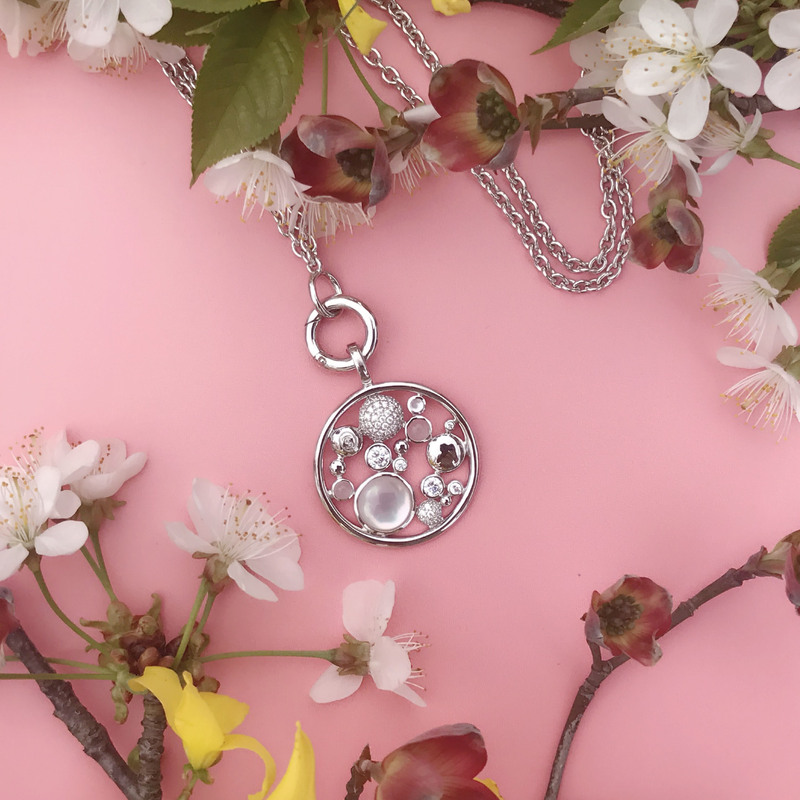 The Mother’s Day collection has seen the addition of two new locket styles and some fun new concepts for filling them. 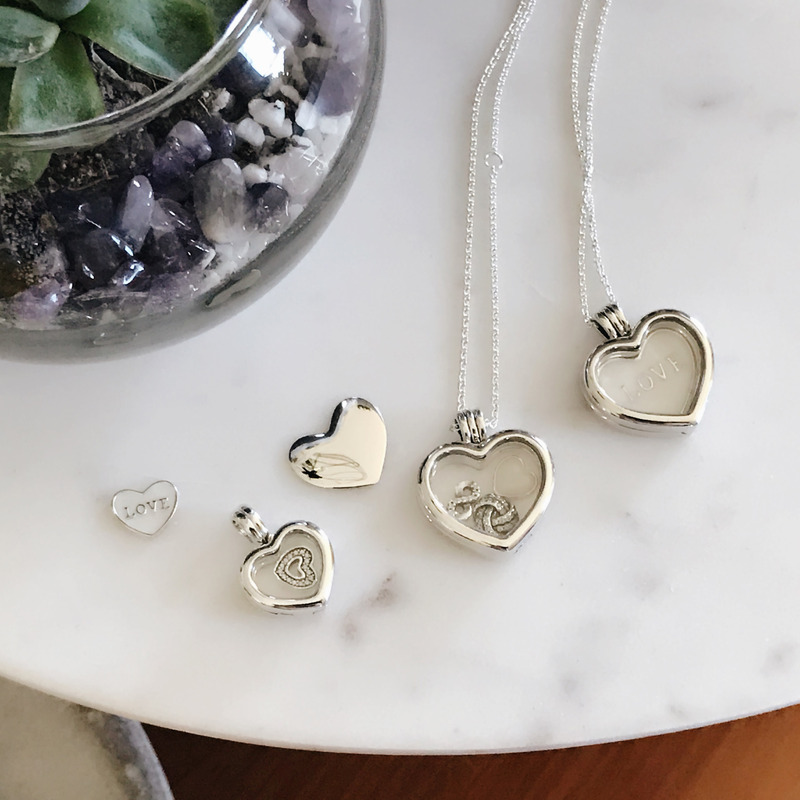 A medium sized heart locket necklace can display a set of three petite charms and a small heart locket can display a single charm. 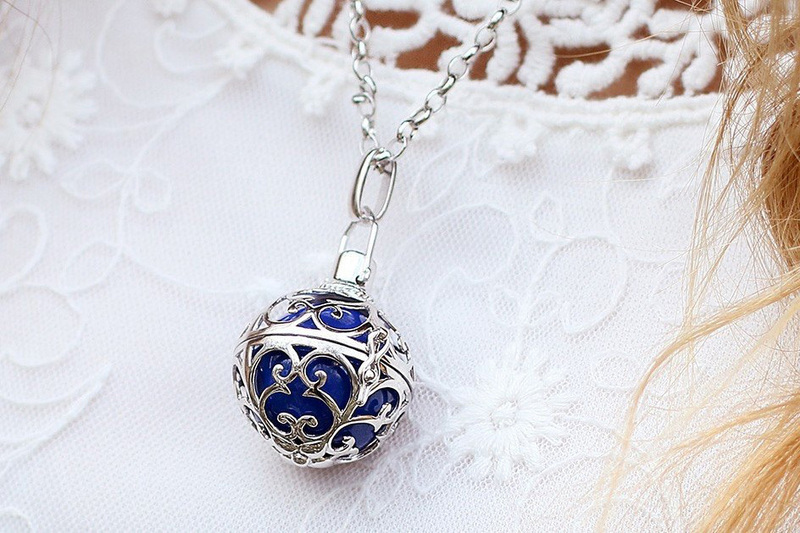 The smaller locket can be worn on a chain or on the bracelet. 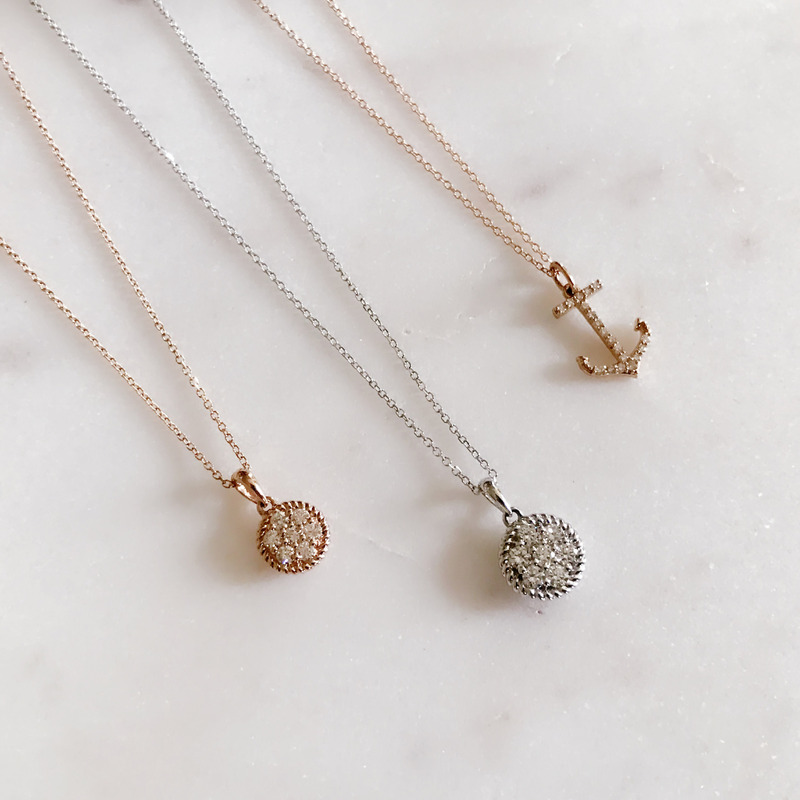 The smaller locket comes filled with a single heart charm that can be interchanged with any of the petite charms to change the look of the locket. 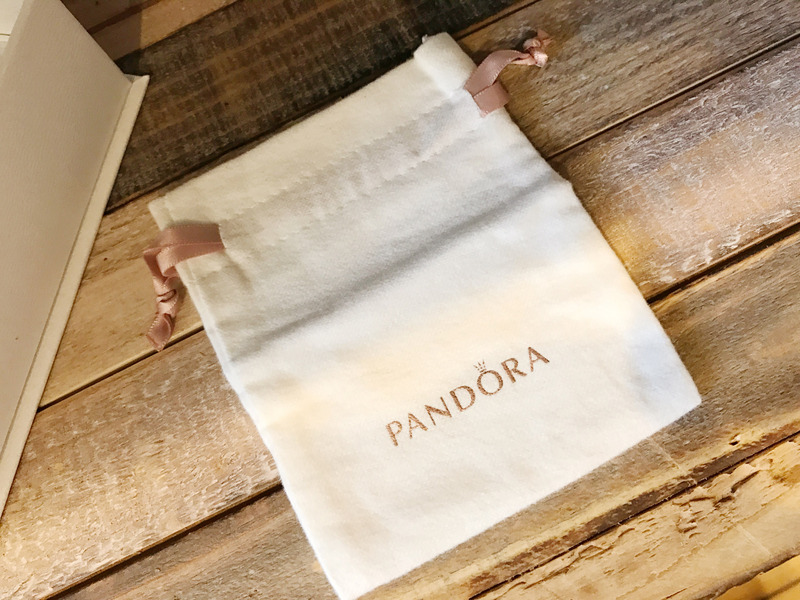 In addition to the new lockets, Pandora has released plate inserts that fill the back of the locket. 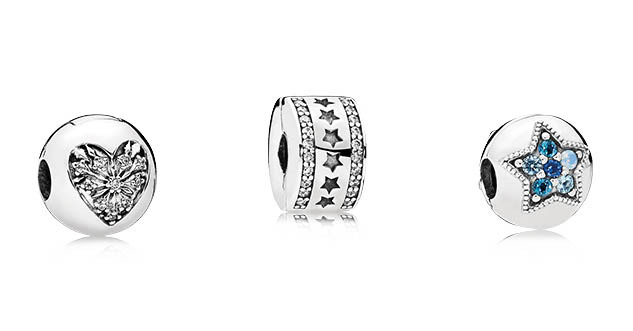 These inserts can be worn by themselves for a simple statement or layered with petite charms. 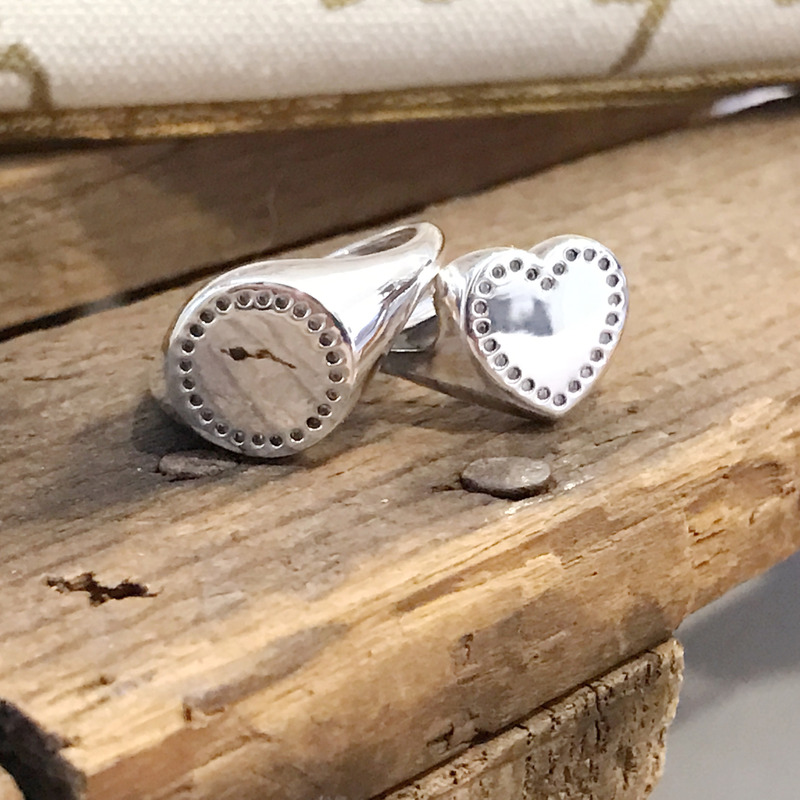 We love the new white enamel insert with “love” written across the heart! 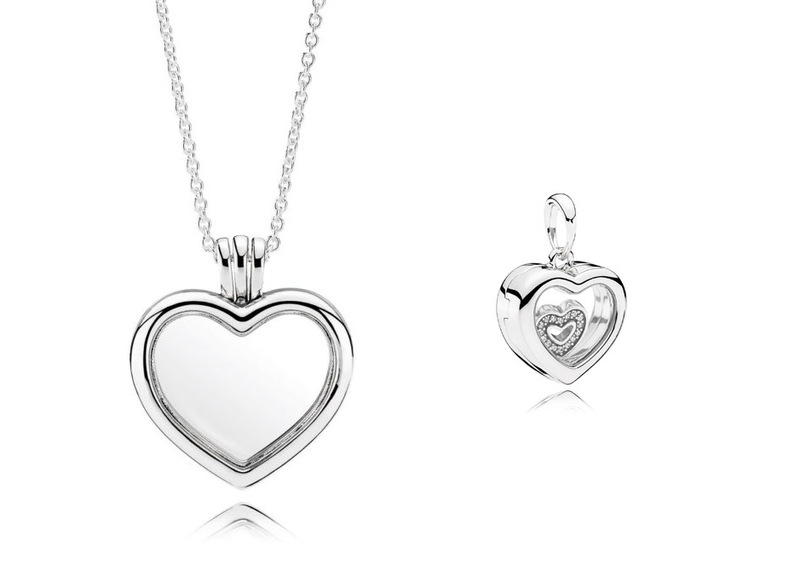 The enamel plate and a plain silver plate are available for the medium heart locket. 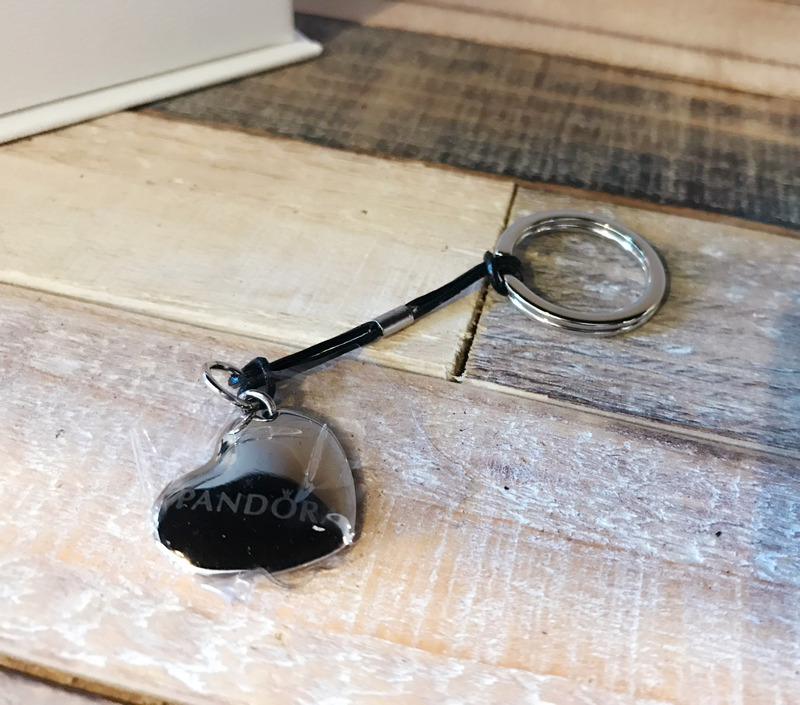 A small enamel plate is available for the small heart locket. 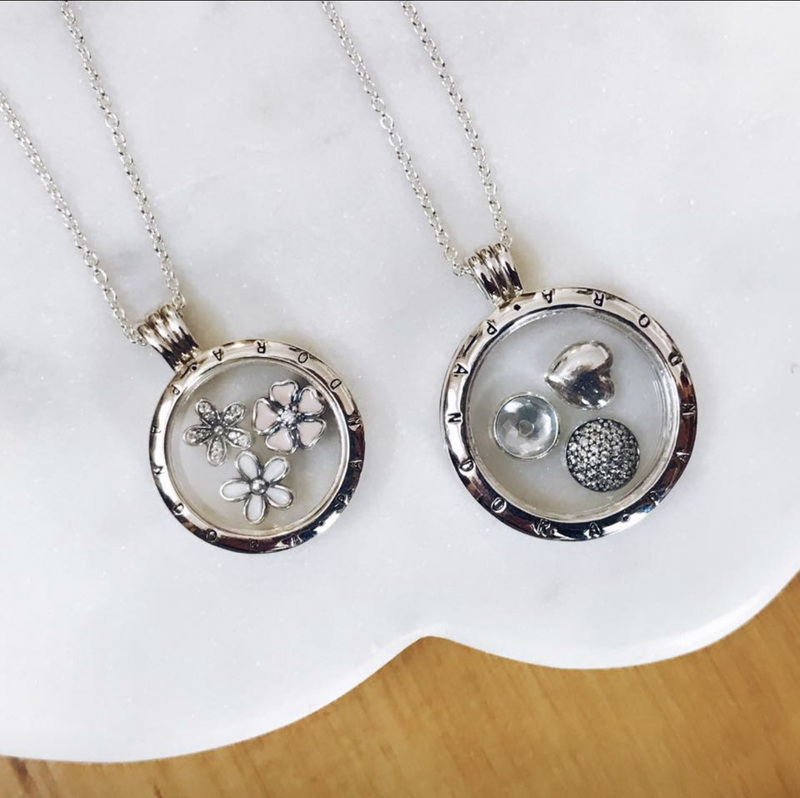 The small plate can also be used in the larger locket as a floating charm! 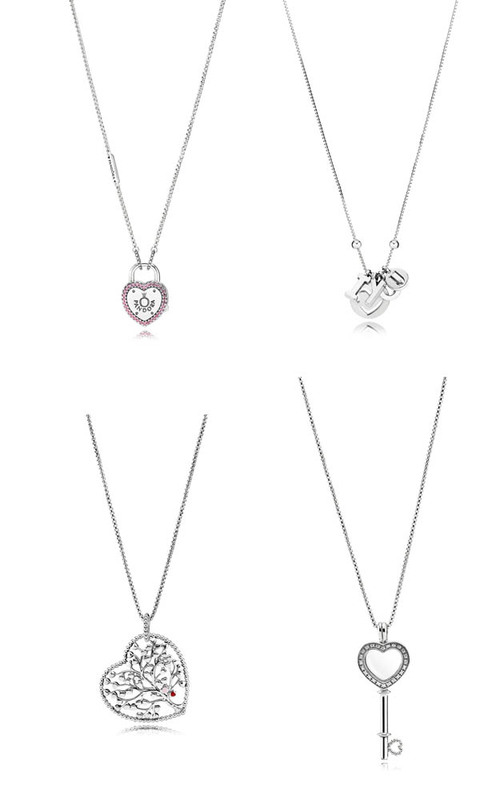 Lastly, a new set of Petite Charms, Infinite Love, was released with this collection as well. 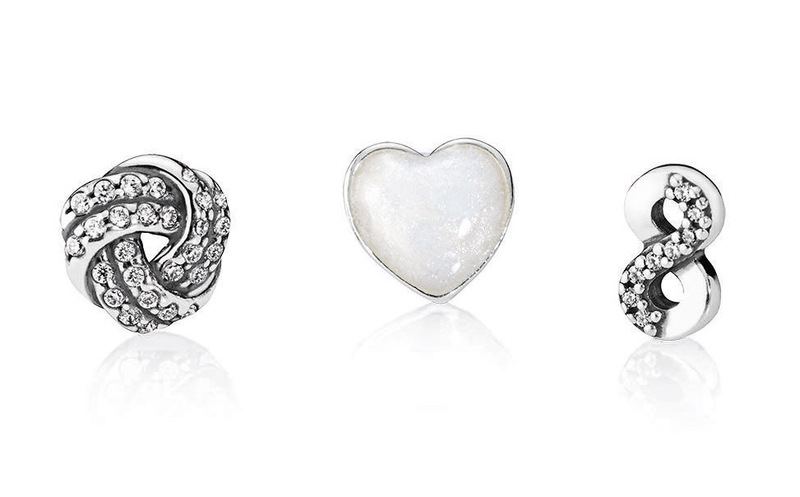 These charms feature a mini Sparkling Love Knot, a sparkling infinite symbol, and a white enamel heart. 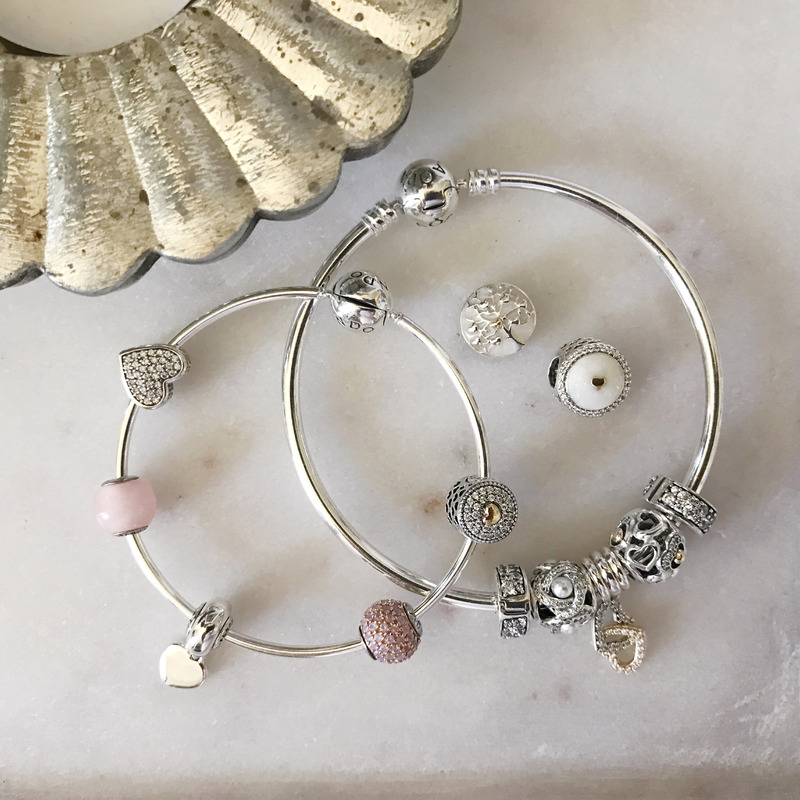 As always, the Mother’s Day collection includes a new assortment of family and love related charms to add another layer of love to mom’s bracelet. 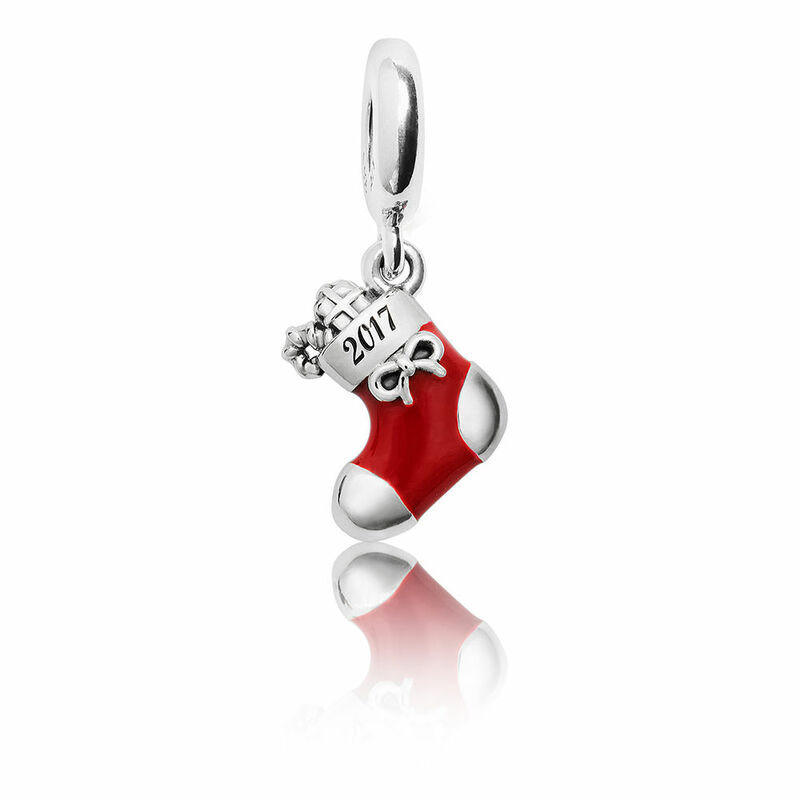 This years charms are themed around celebrating relationships and accented with gold and pearls. 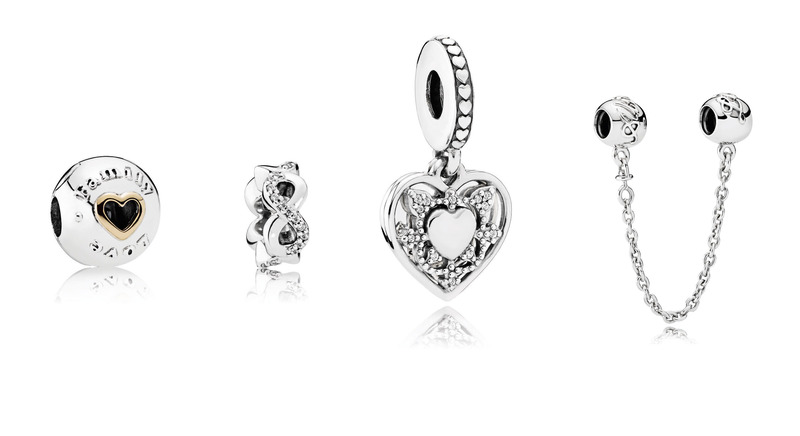 The new family tree charm, Tree of Hearts, is the first family tree charm that is not a dangling style. 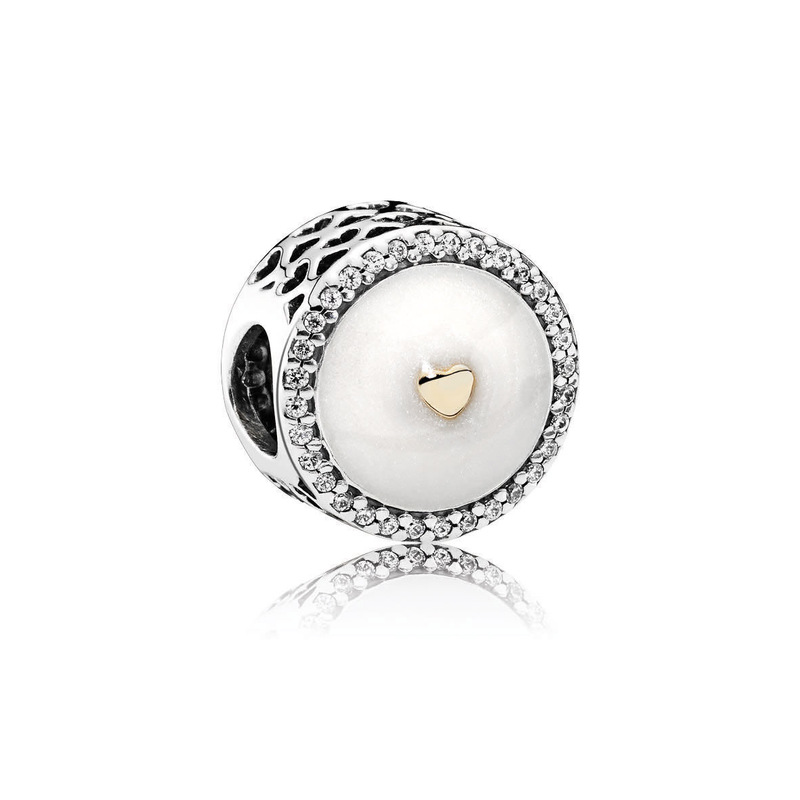 With its pretty iridescent white enamel and gold heart, it is a beautiful way to honor the bonds between family members. 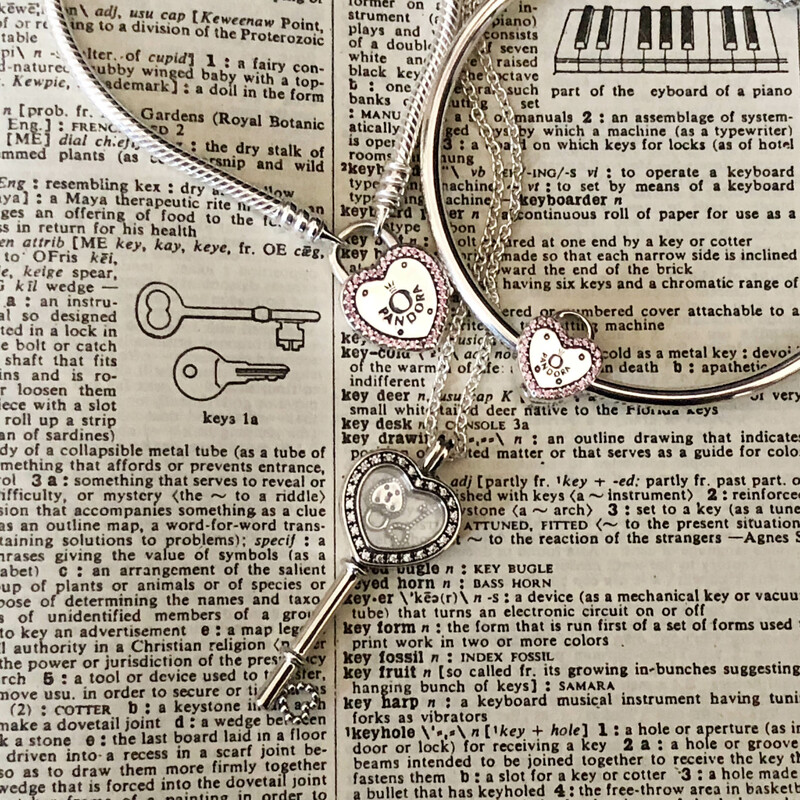 The Interlocked Hearts and Heart of Romance charms also feature a touch of gold and are a great way to bring some warmth to a black and white bracelet. 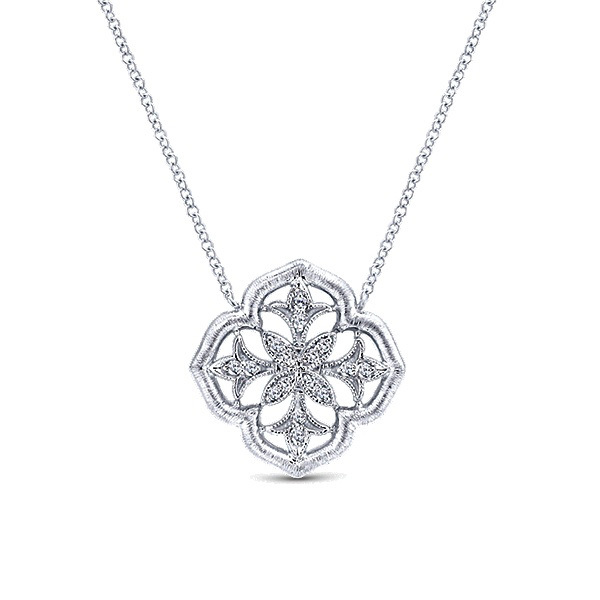 The Luminous Love Knot charm is designed to mirror the Sparkling Love Knot with the addition of pearls. 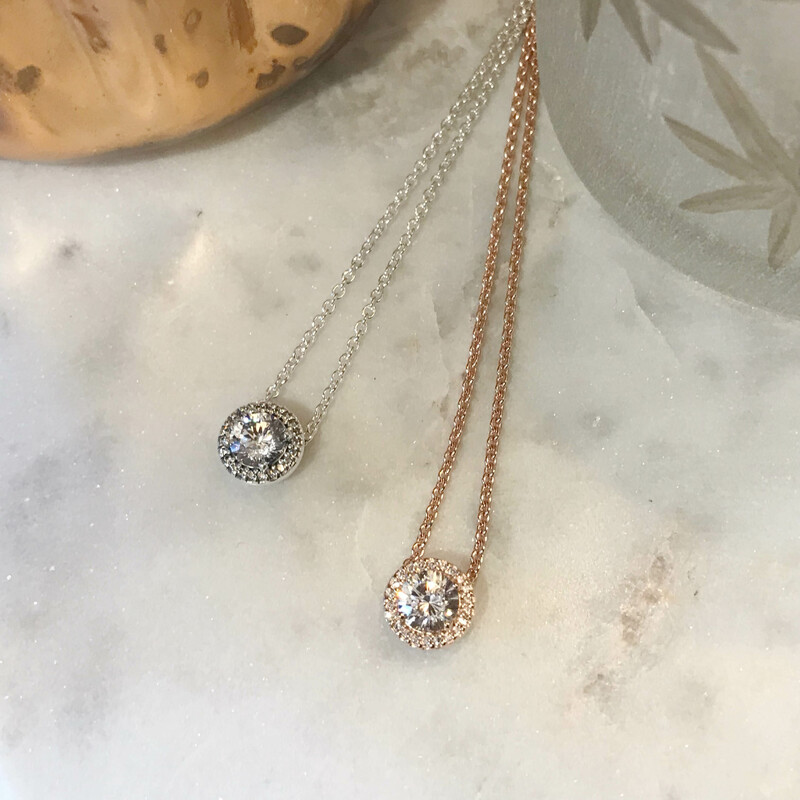 Part of a collection that includes a pendant, earrings, and necklace, this charm is a great gift for the mom who loves classic elegance. 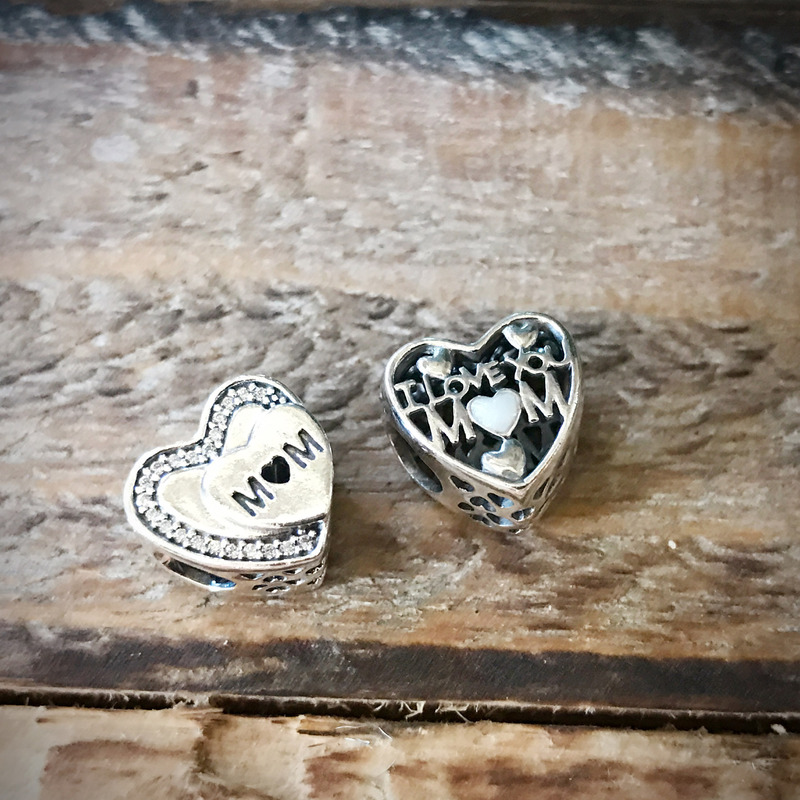 The Mother & Son Bond heart charm is adorned with “Mother” on one side and “Son” on the other. 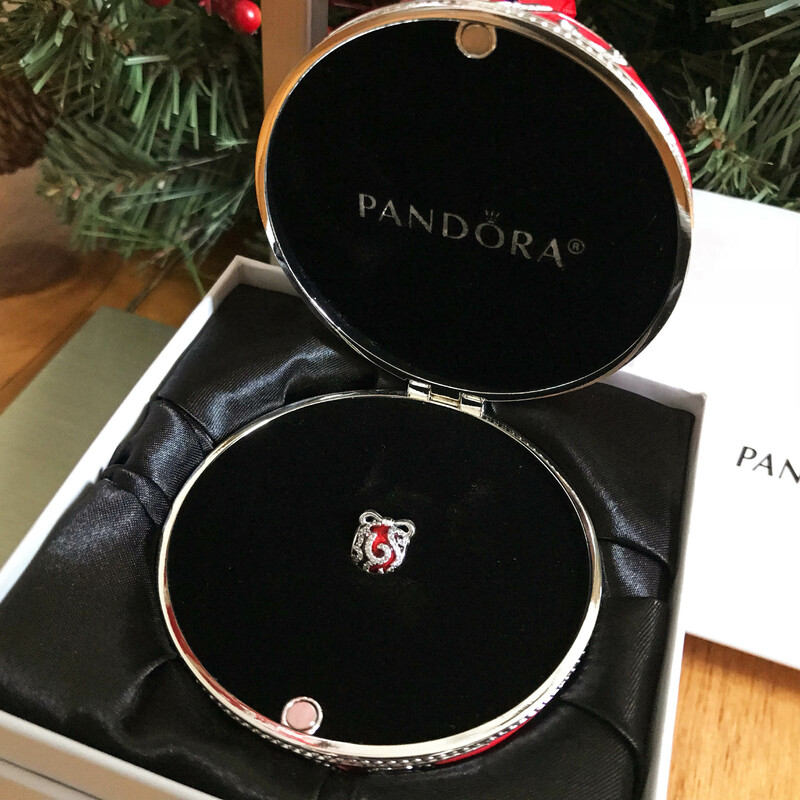 A great gift to celebrate the mom of boys, it shows how a mother and son are two parts of the same heart. 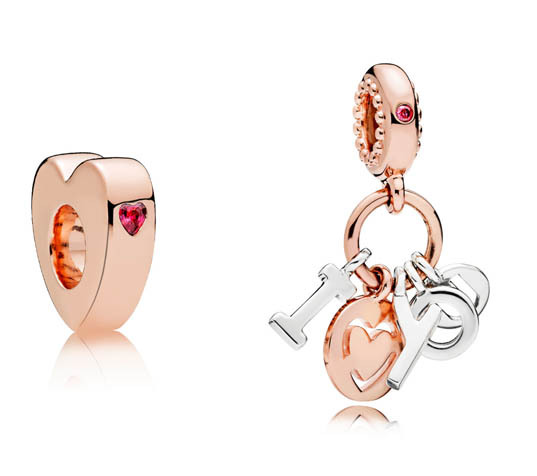 Similarly, the Mother and Daughter hearts show the special bond between mother and daughter. 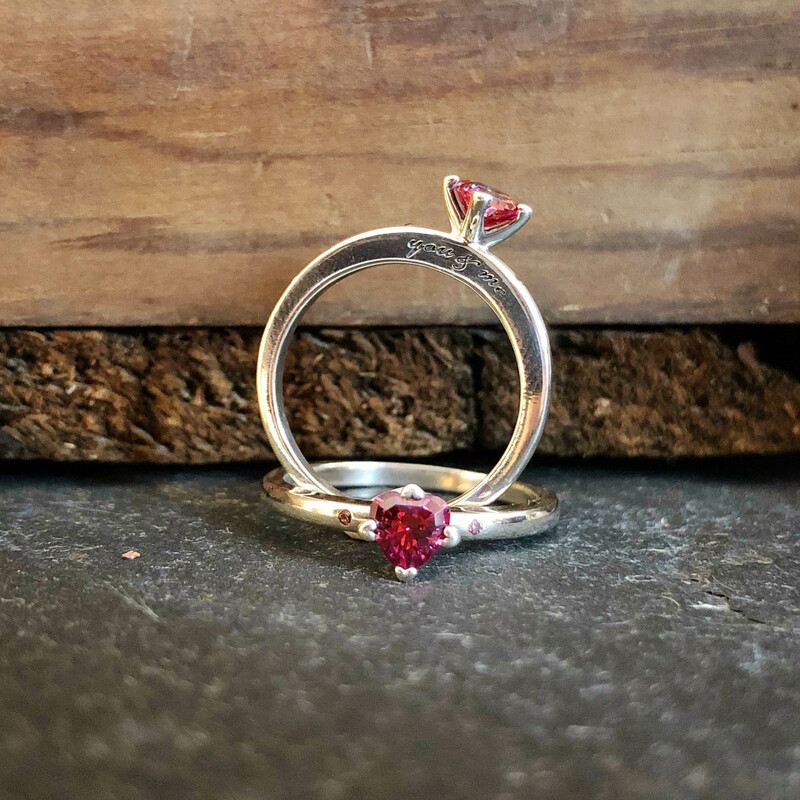 In this set, mom gets to keep one half of the heart and daughter gets to wear the other! 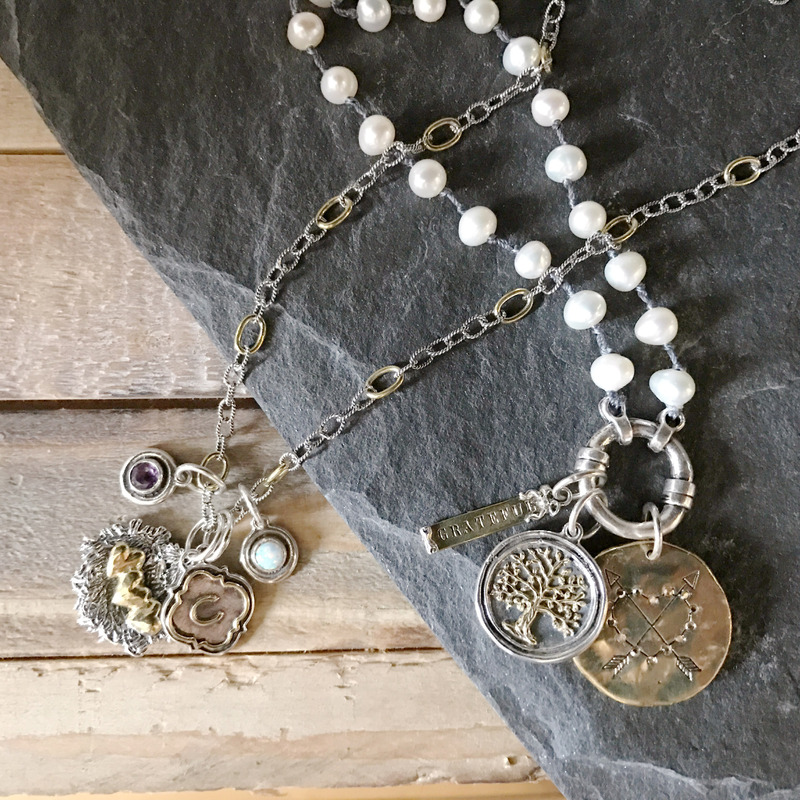 Tribute to Mom and Love for Mother are great choices for a mother-themed bracelet. 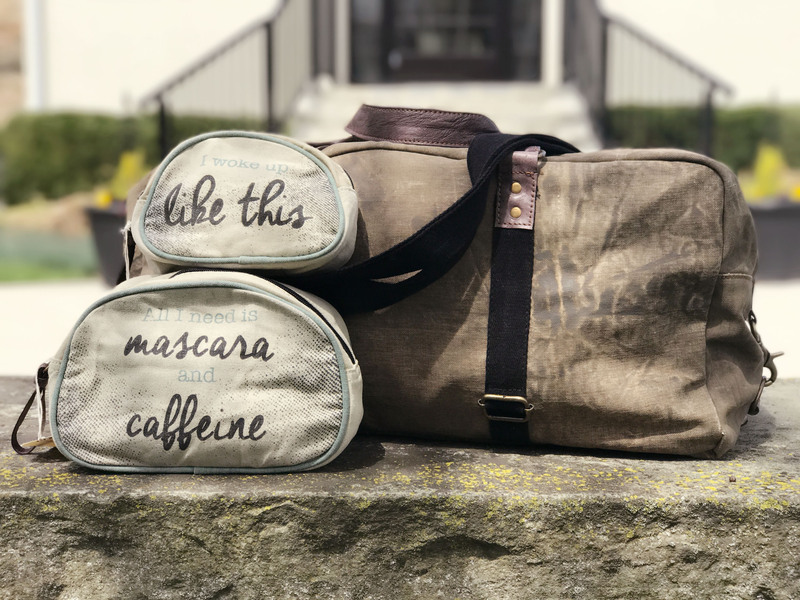 These Mother’s Day new releases are perfect for the mom who collects a special mother charm every year on this holiday. 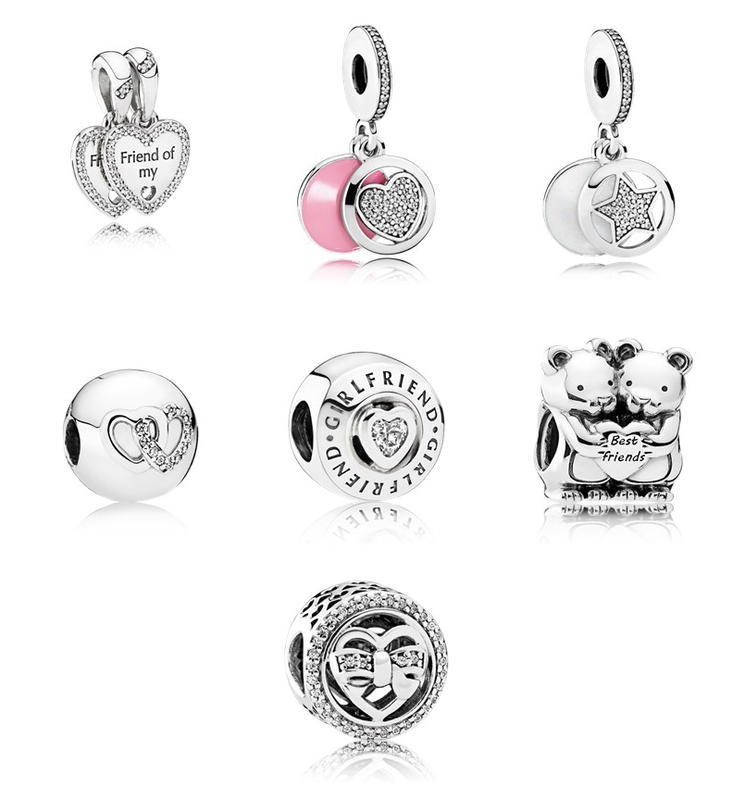 The Pandora Mother’s Day collection this year includes some charms for new moms as well. The new baby stroller is more detailed than past designs and has a crystal heart adorning the side. 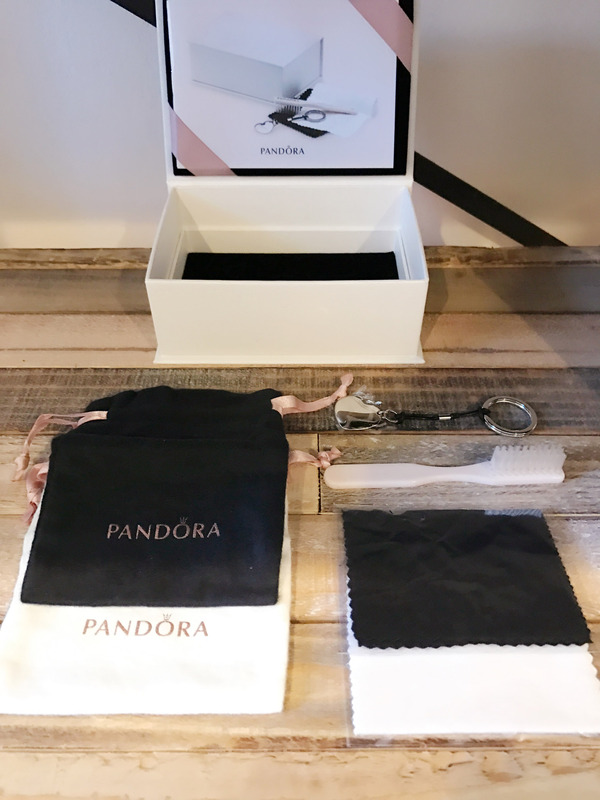 The Baby Treasures dangle includes a small pacifier, teddy bear, and white enamel heart and is a great gift for any mom-to-be. 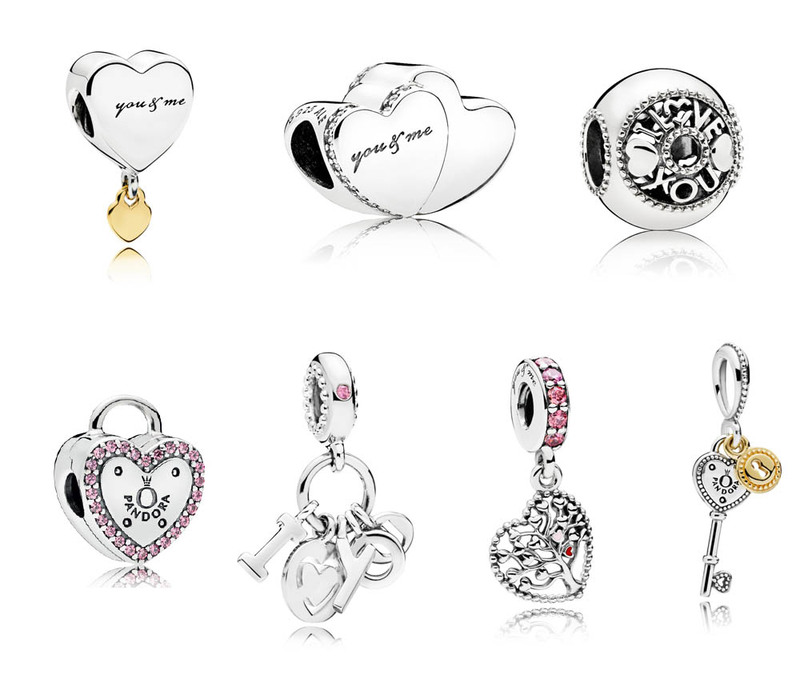 The Precious Heart Charm is one of two Limited Edition charms to be released this year. 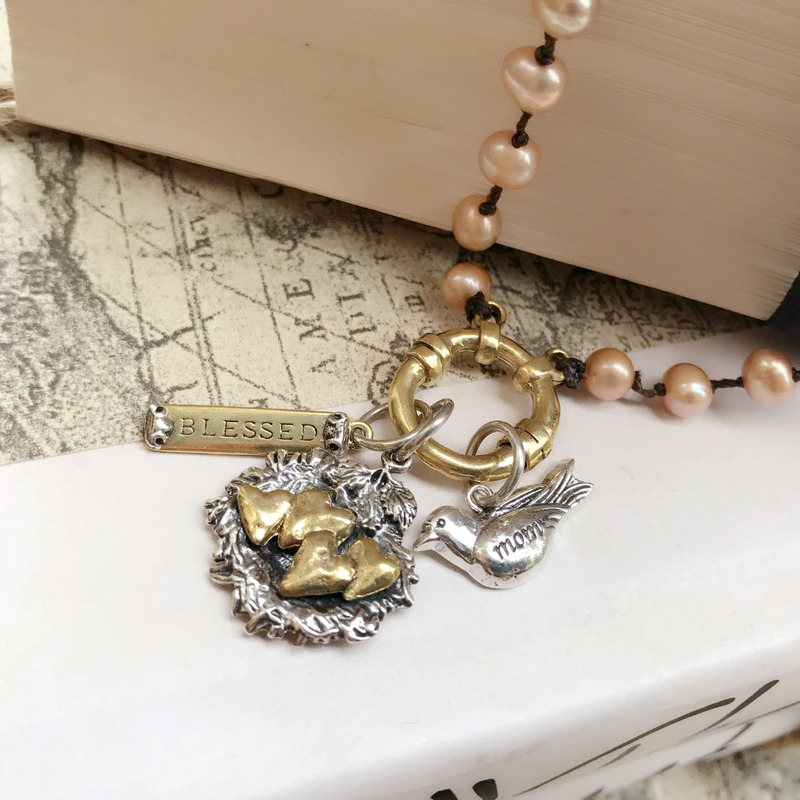 This charm will only be available during the Mother’s Day season! 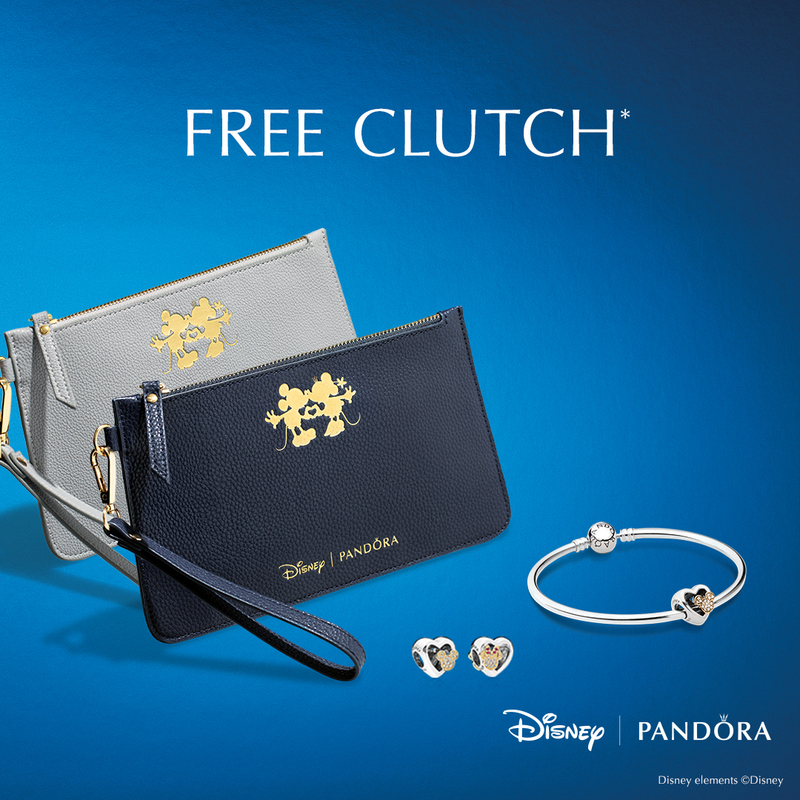 The second Limited Edition charm will be released with the gift sets on April 13th. 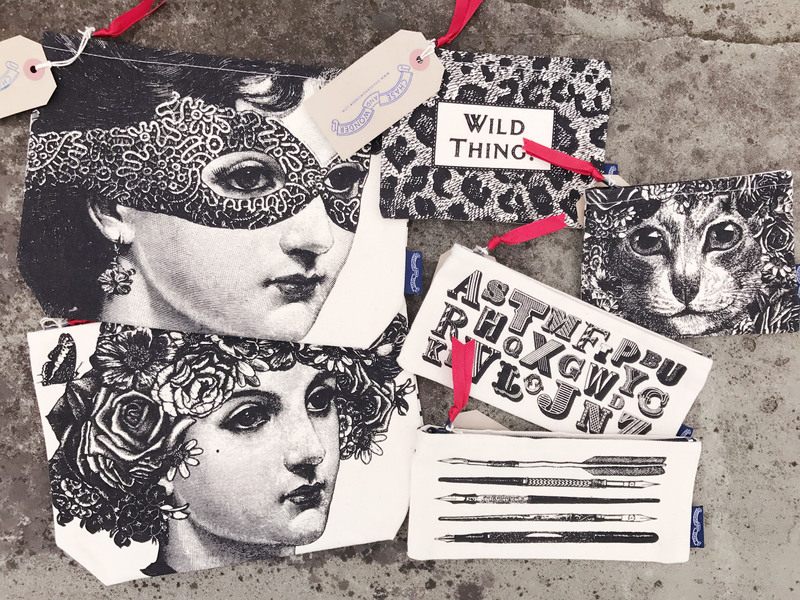 There are also some new releases in the love theme that are a wonderful gift from a husband to a wife. 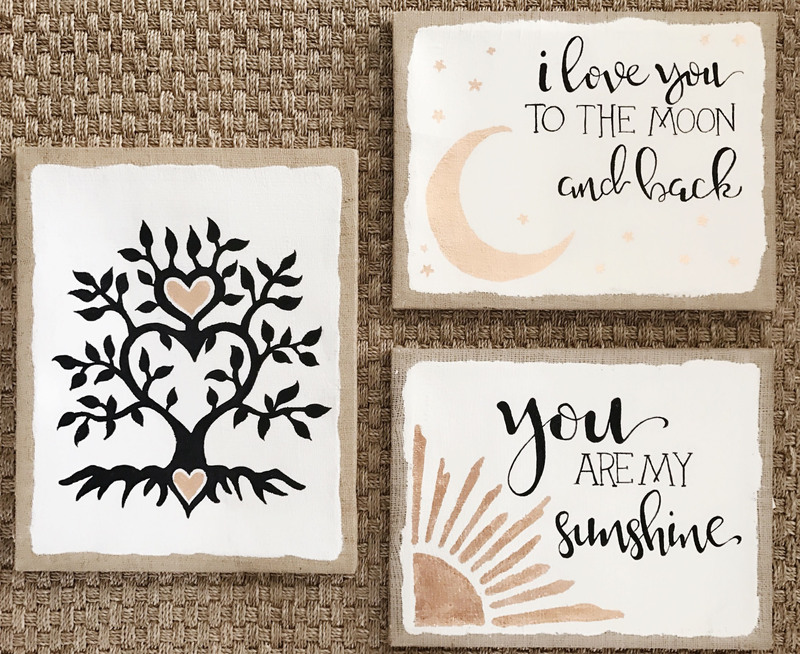 The Family and Love clip features a smooth background with a golden heart center. 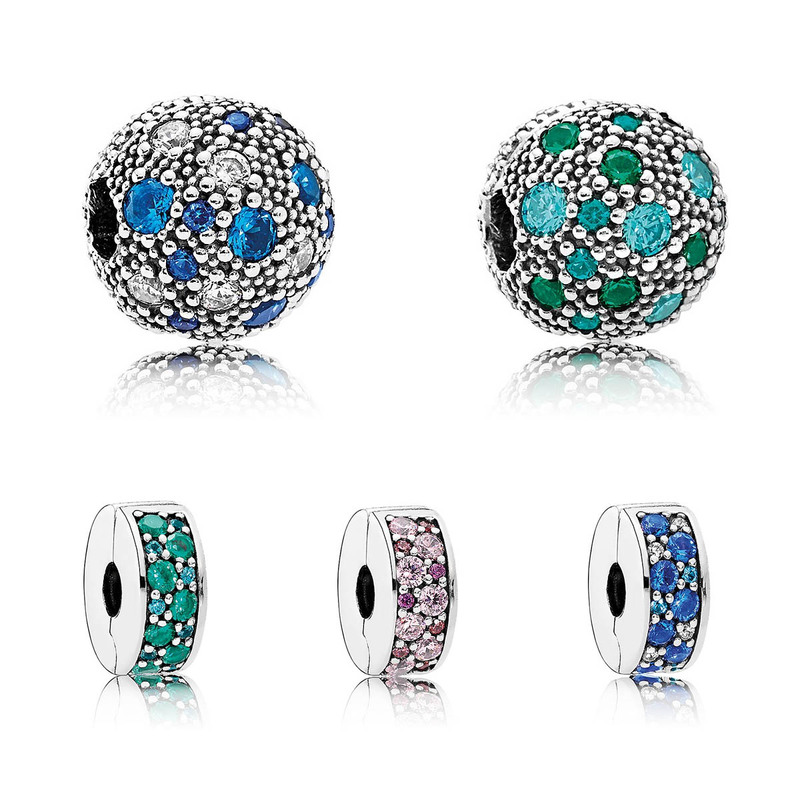 The Infinite Love spacers add some meaningful sparkle on either side of a dangling charm or colorful murano. 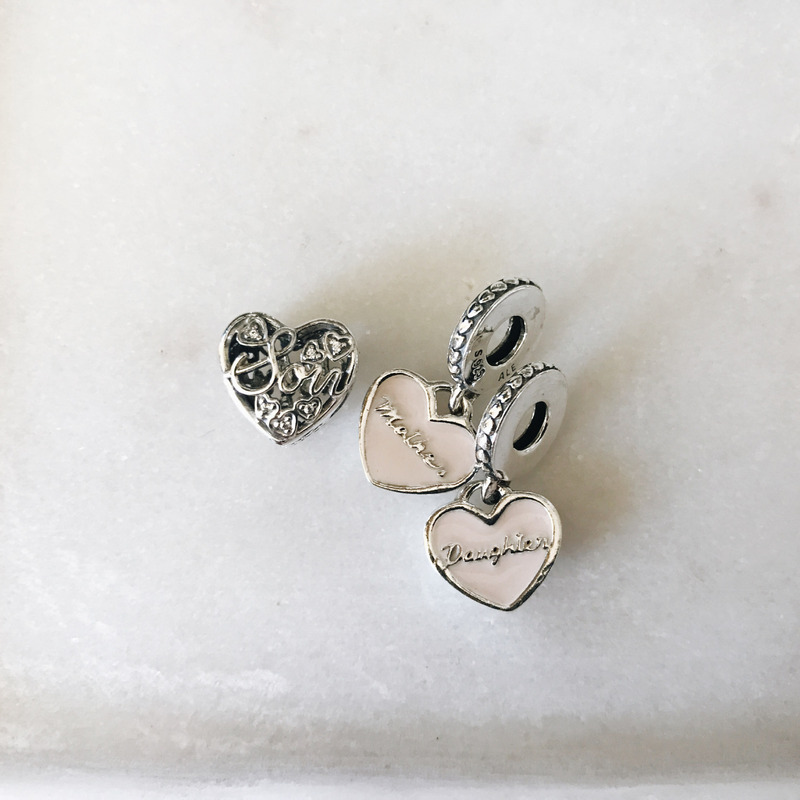 For the romantic, the My Wife Always locket charm has a vintage looking design with “my wife always” engraved on the interior. 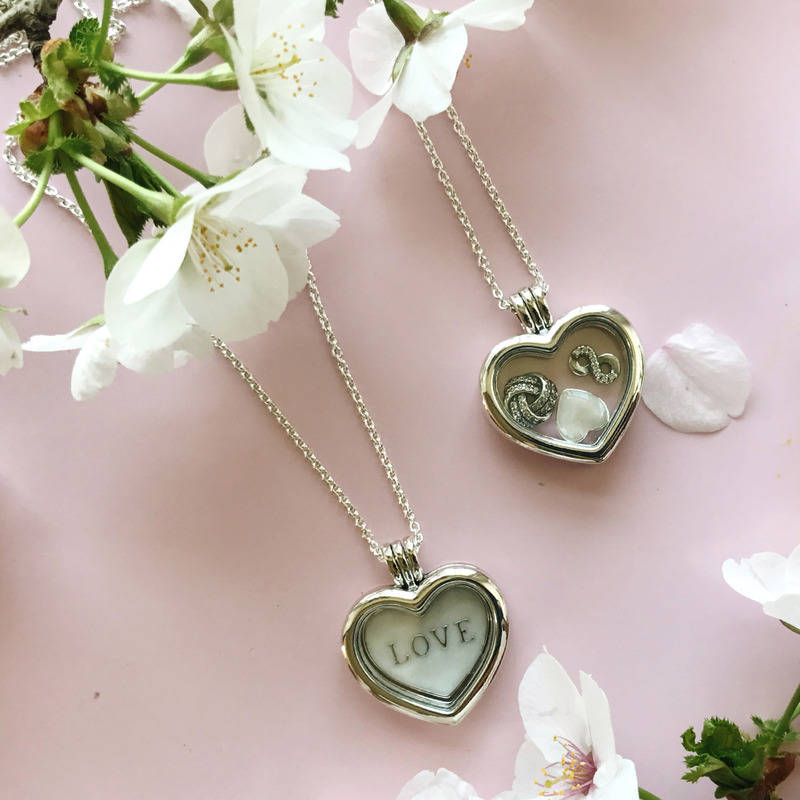 Lastly, the Love Always safety chain expresses a powerful sentiment while keeping mom’s treasures safe! 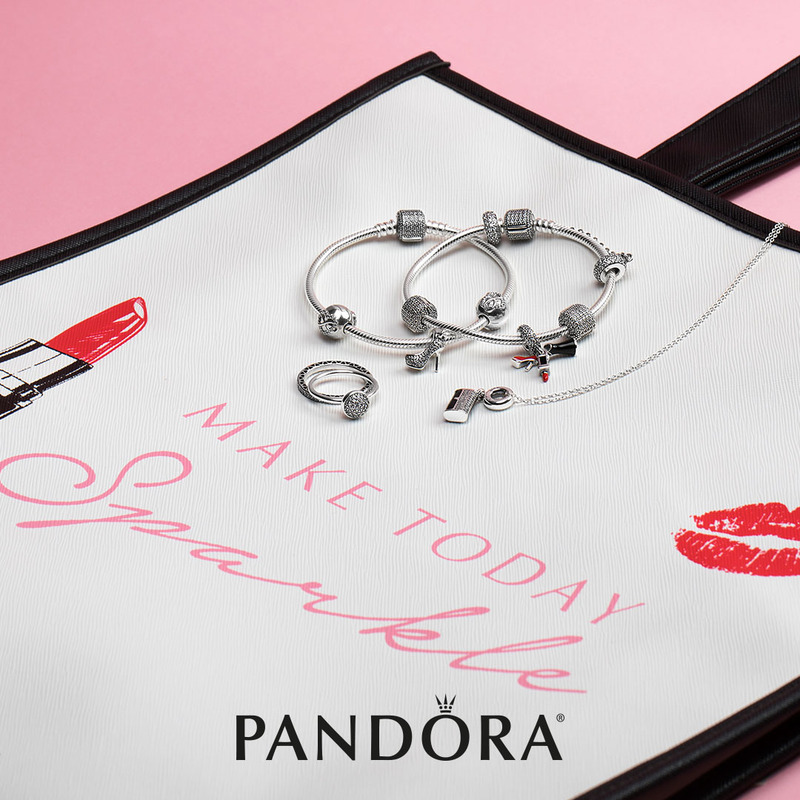 The last charm additions with the Pandora Mother’s Day release celebrate hobbies and occasions. 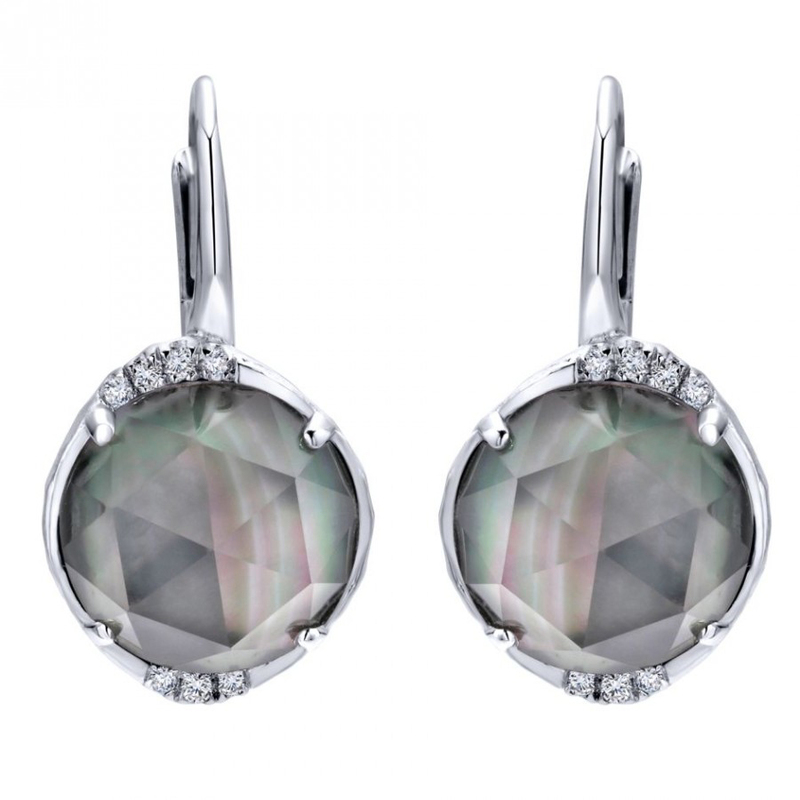 The sparkling dress pairs well with the stiletto and martini glass to represent a gal that enjoys a night on the town. The running shoe is a good choice for a mom on-the-go or an avid runner. Lastly, the newly designed graduation cap is tailor-made for the proud graduate. 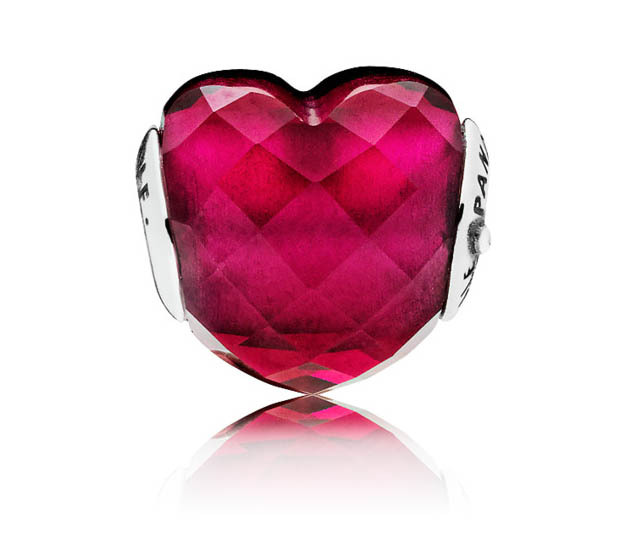 We love the hearts on the charm’s bale! 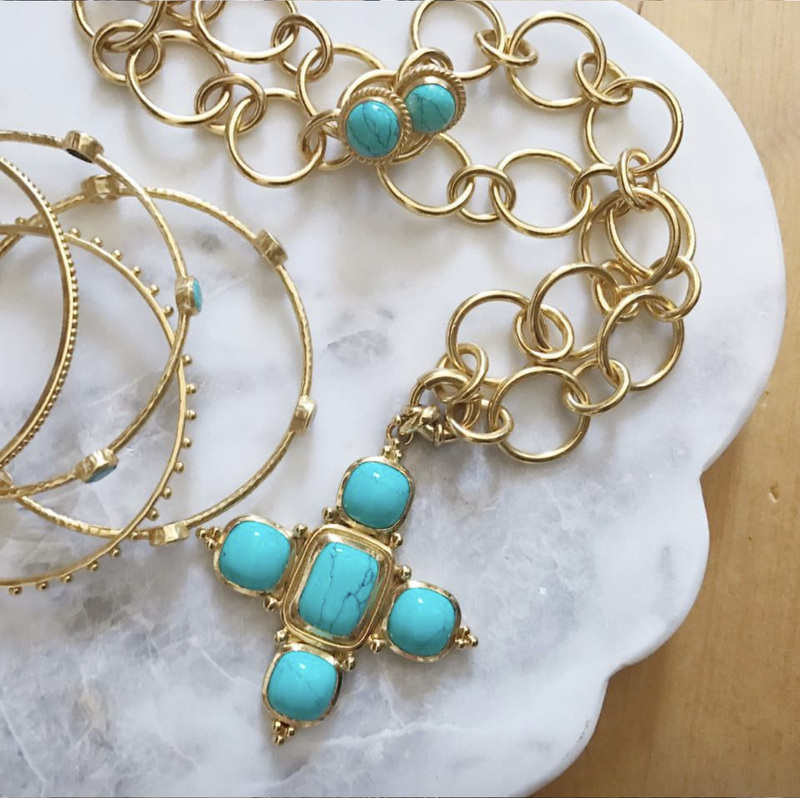 We love the new jewelry additions that were released this year. 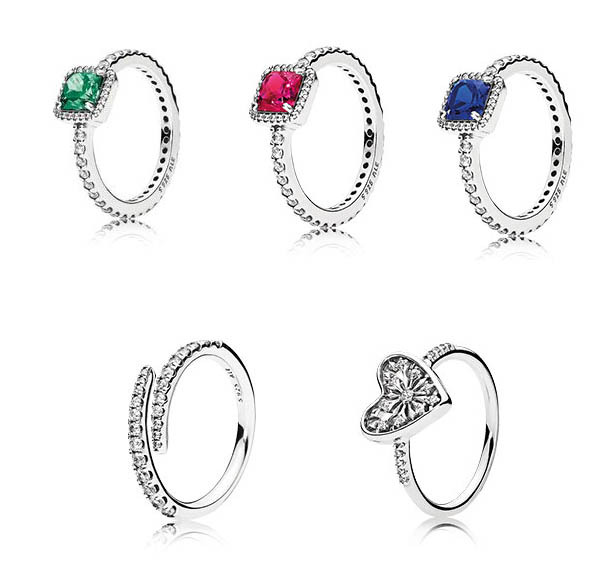 There are a ton of great new rings in some innovative styles! 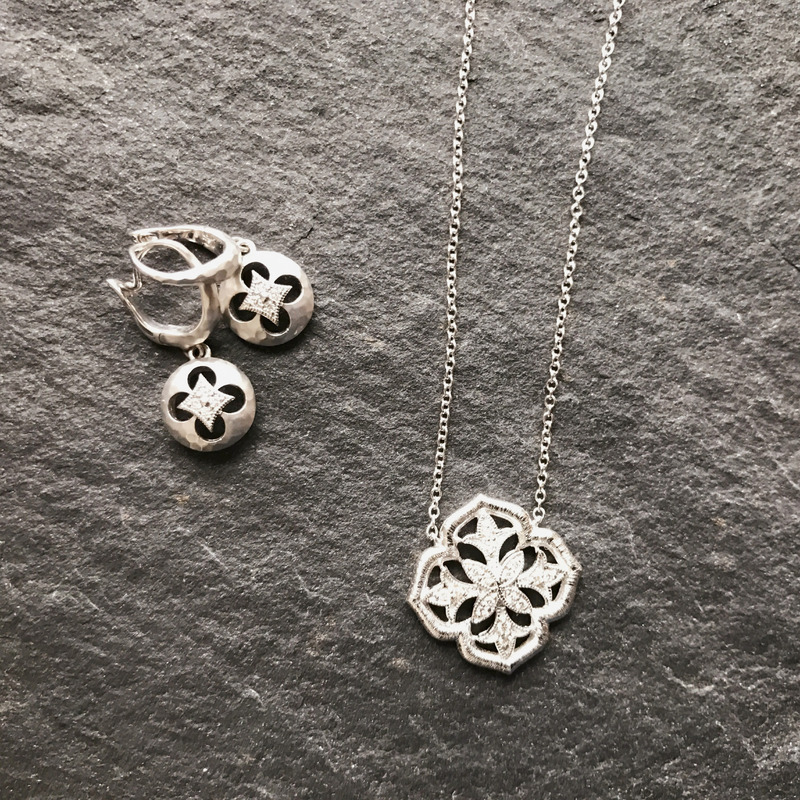 The Luminous Love Knot collection, like the Sparkling Love Knot, includes a pendant, ring, and stud earring design. 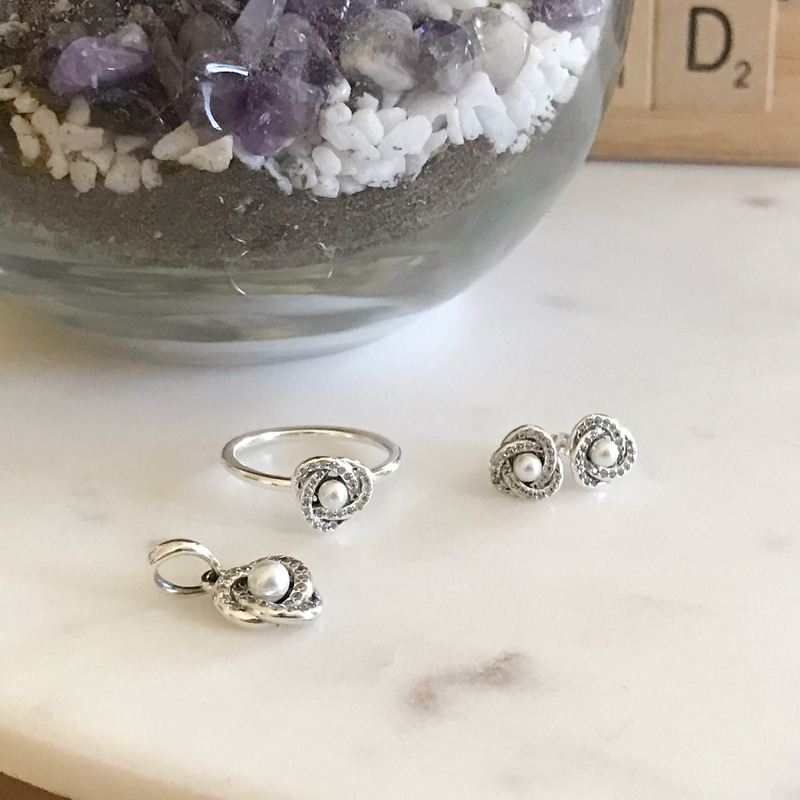 Accented with a small pearl, they are a great update to a current favorite. 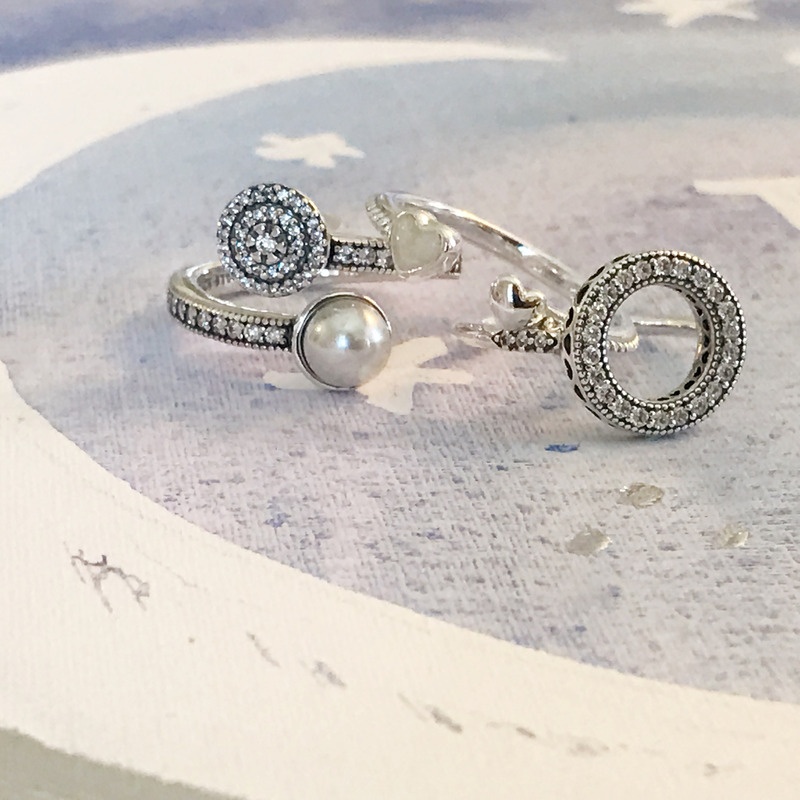 On the ring side, the new pearl wrap ring is a stunner! 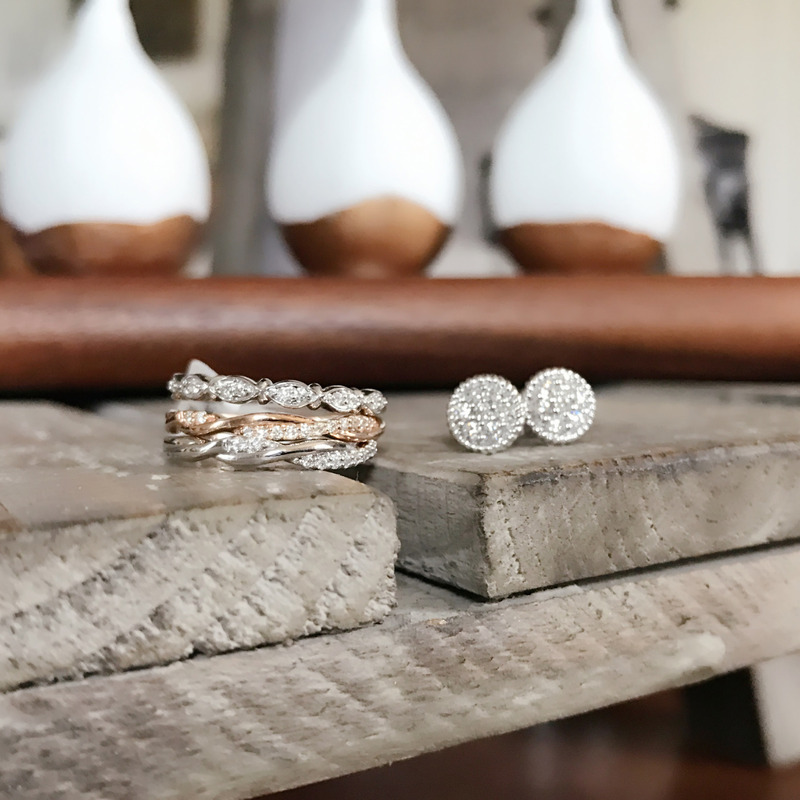 We also love the halo design ring to make a statement without feeling too weighty. 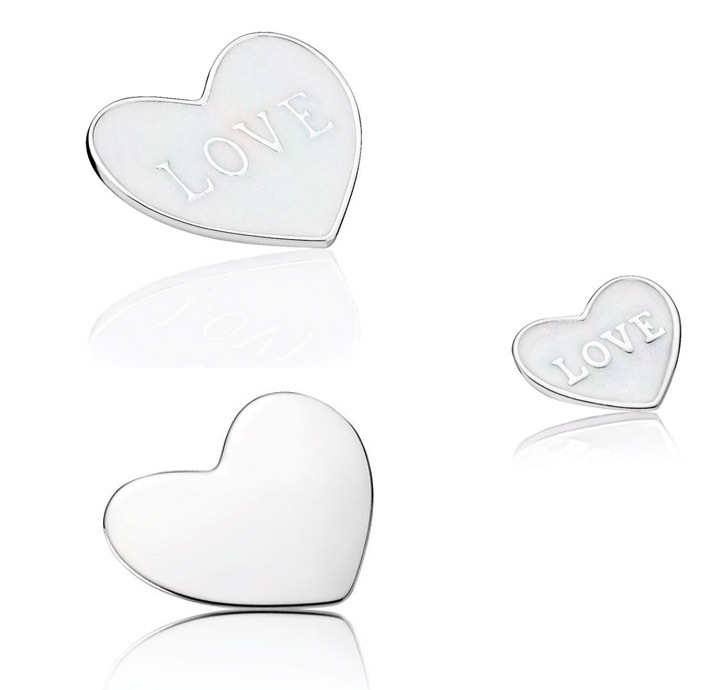 The double ended heart ring, with one side in shiny silver and the other in white enamel, is very sweet and petite. 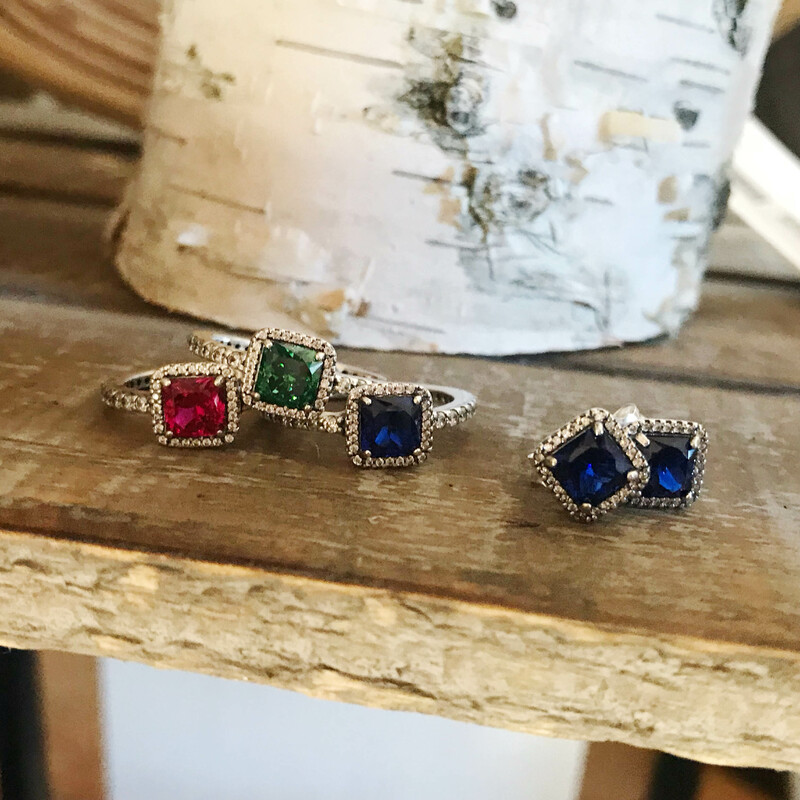 To make a bolder statement, the new circle and heart signet rings add a new twist to a tried-and-true design. 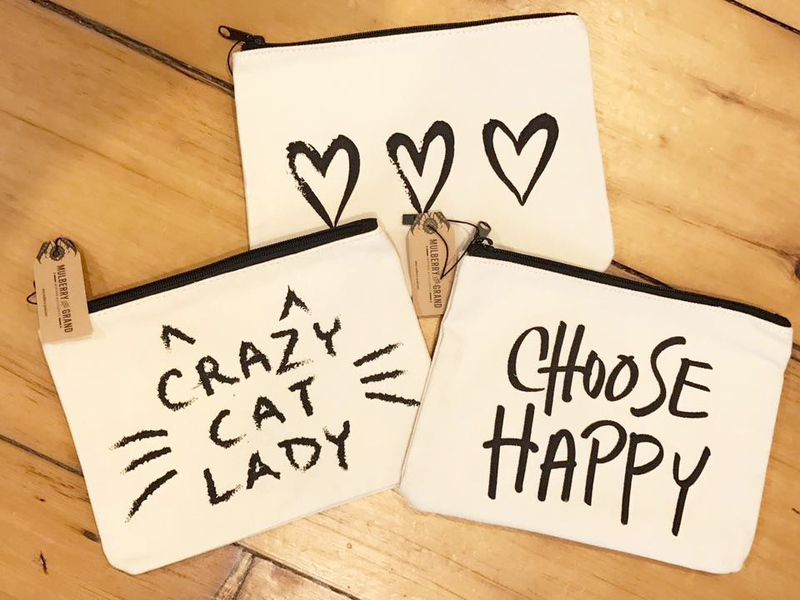 This is a very on-trend style. Get them engraved with an initial to really make it personal! 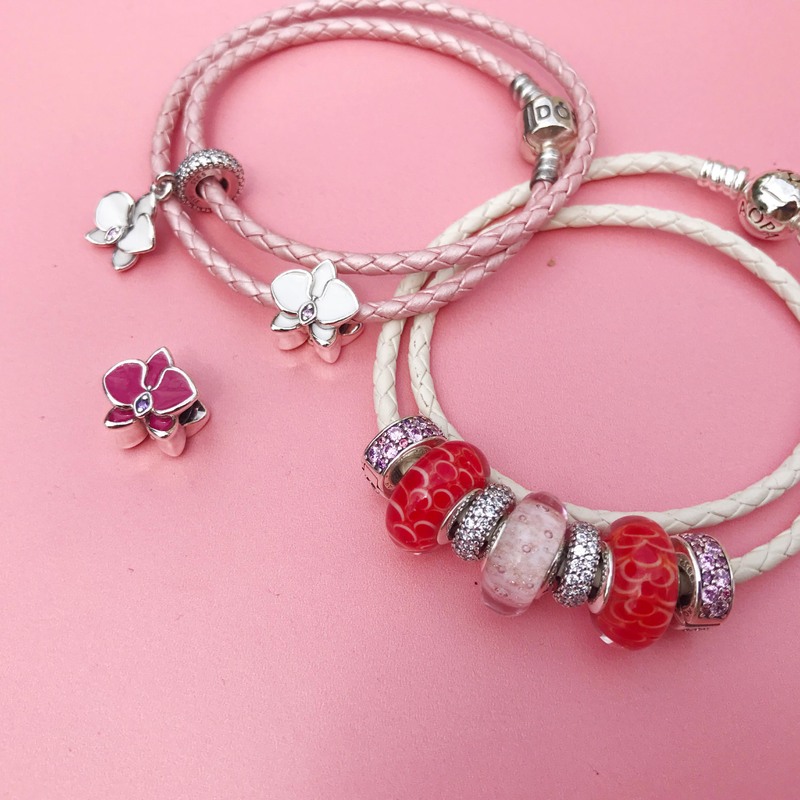 The Sparkling Strand bracelet, a staff favorite, got a new look with some pink crystals. 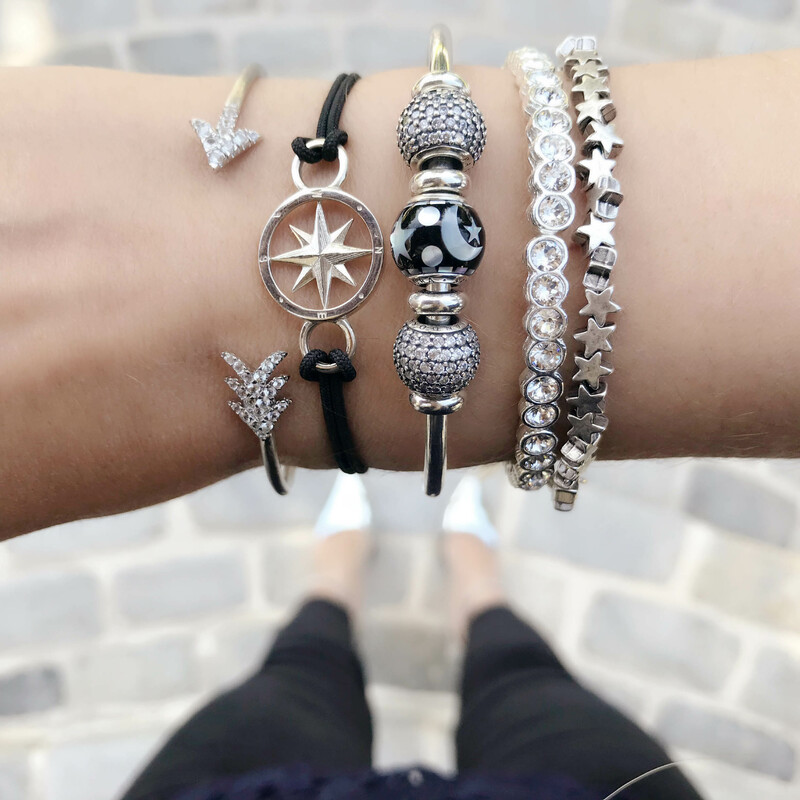 This bracelet is dainty, adjustable, and extraordinarily sparkly. 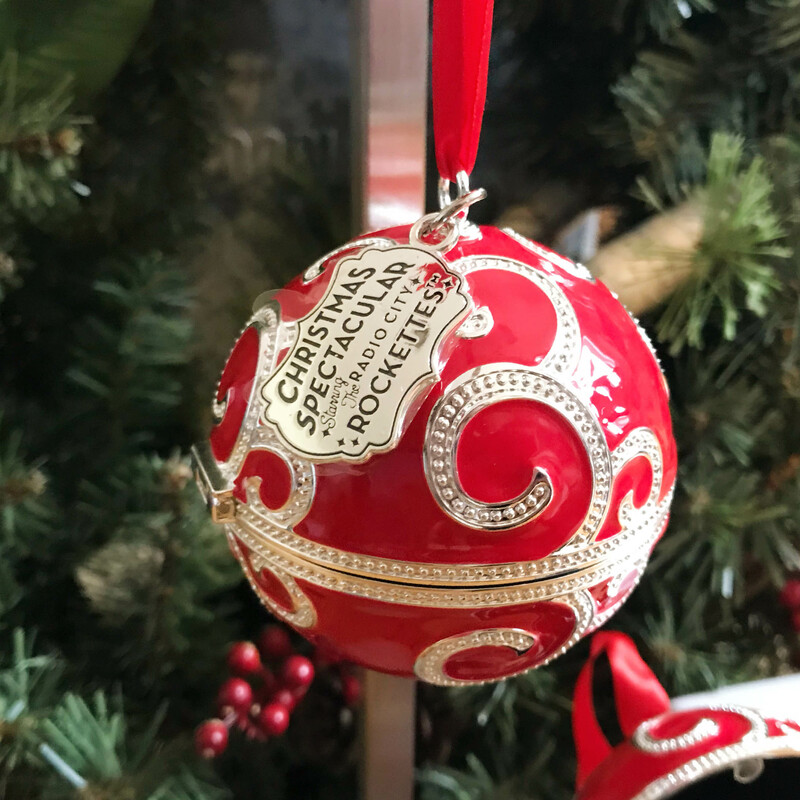 At $50, it’s a steal! 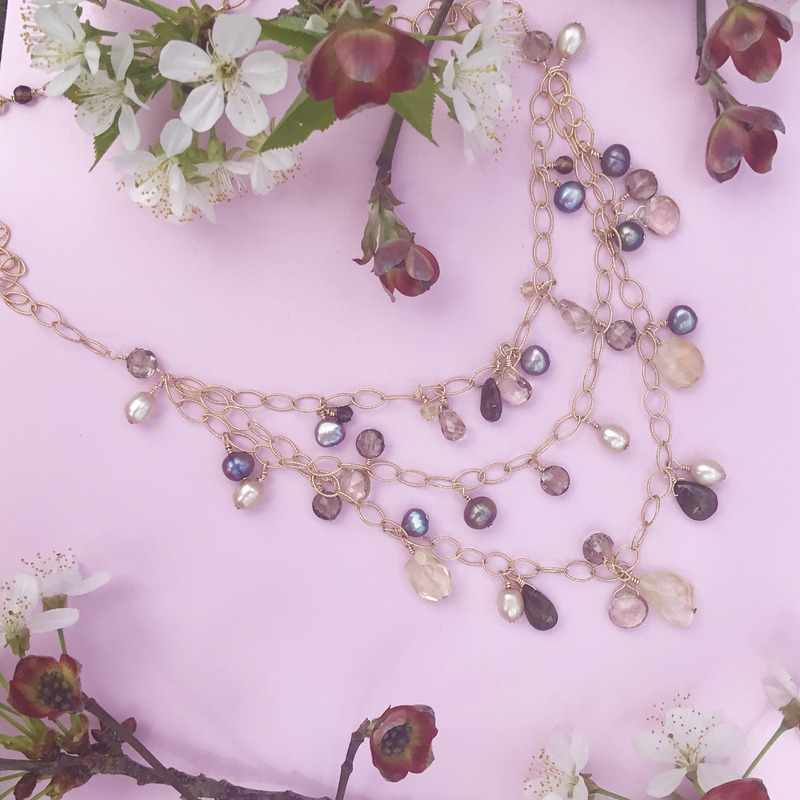 The last jewelry additions include some beautiful and innovative pearl pieces. 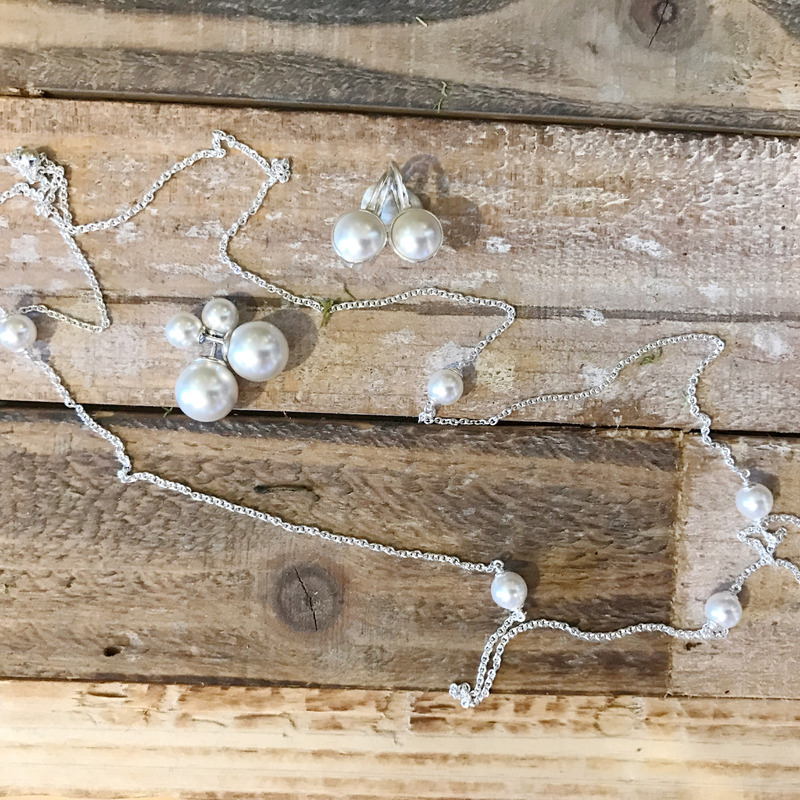 A long pearl-accented chain necklace is adjustable using a small bead with a silicon stopper. 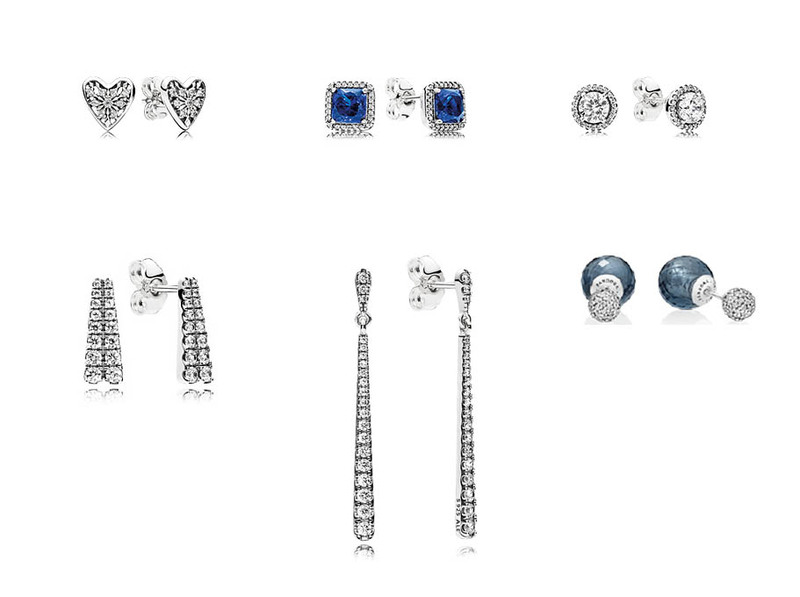 We love the double-sided pearl earrings. 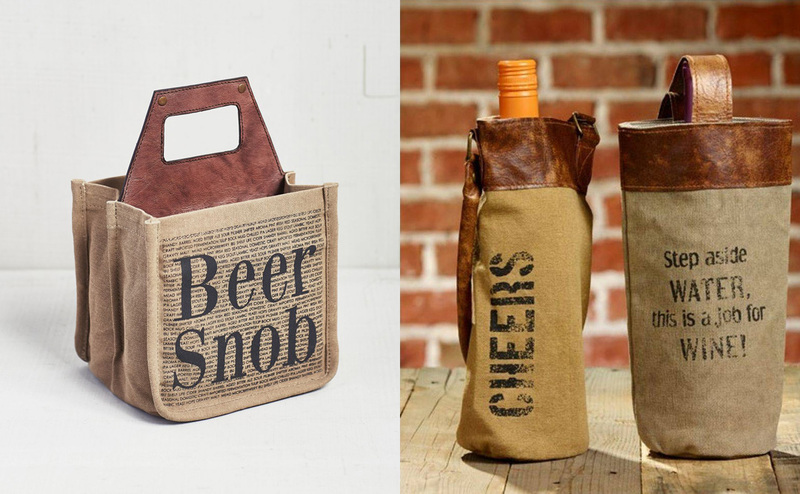 Not only are they reversible, they offer an amazing profile view! 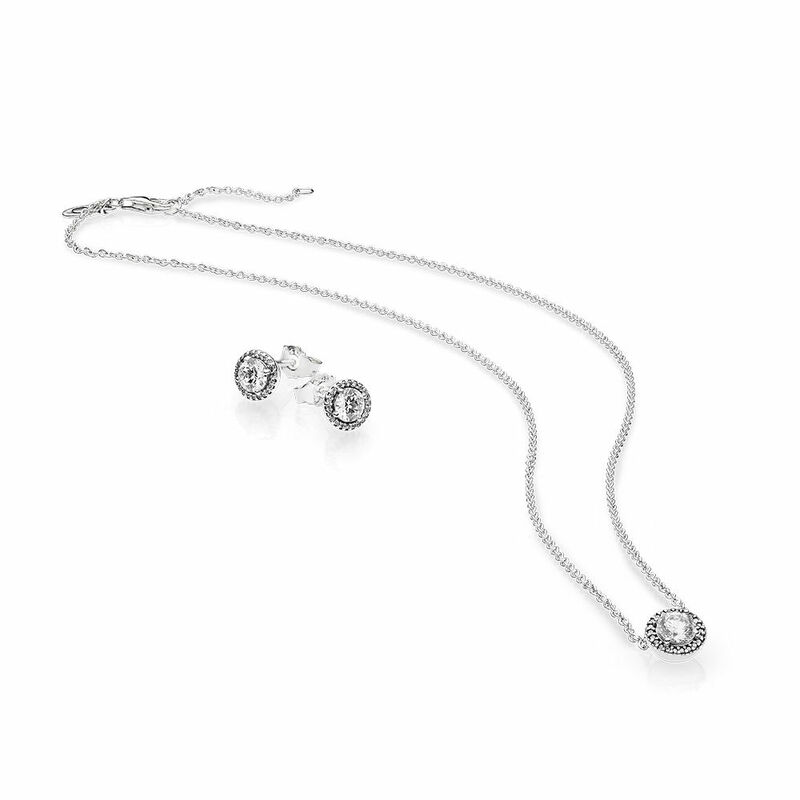 The Luminous Droplets earrings and pendant are perfect for the simple girl who likes an understated look. 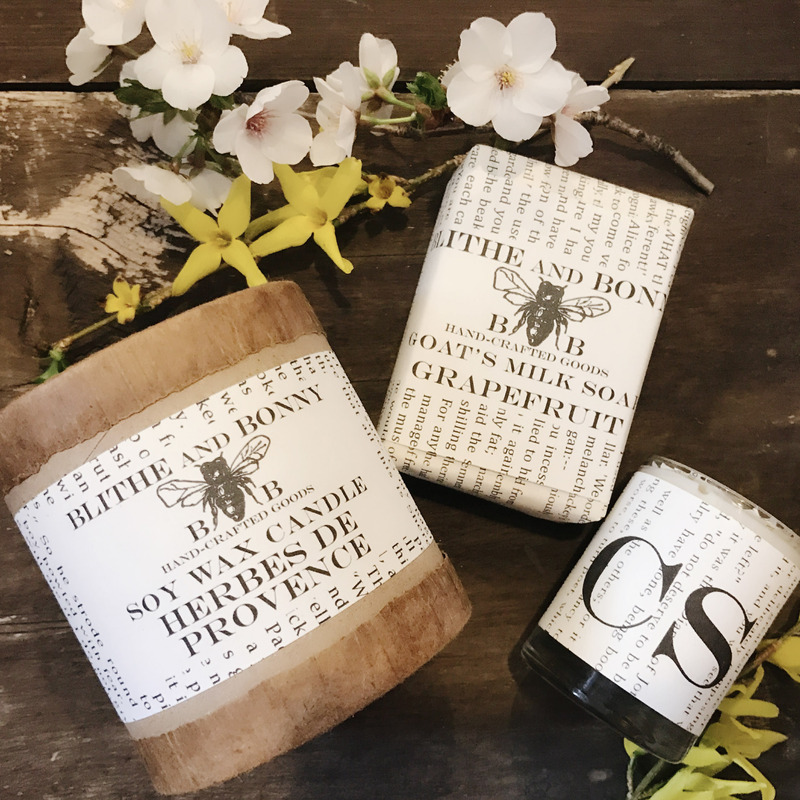 Make sure to stay tuned for news on the Mother’s Day Gift Sets, available starting April 13th!